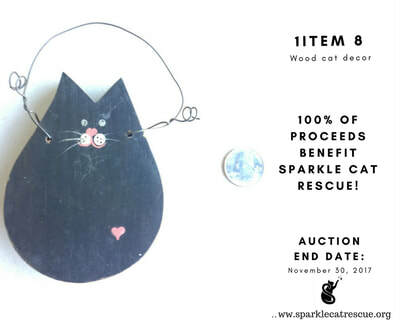 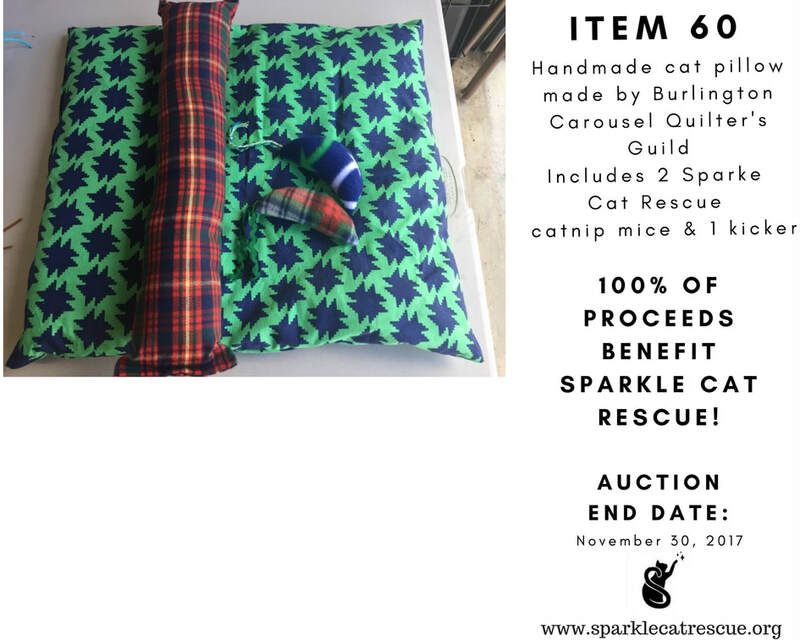 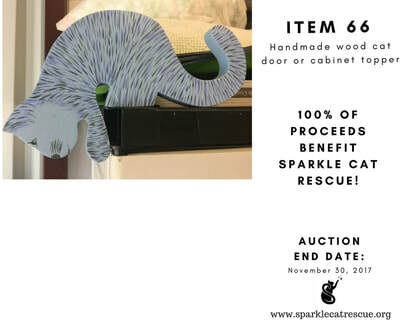 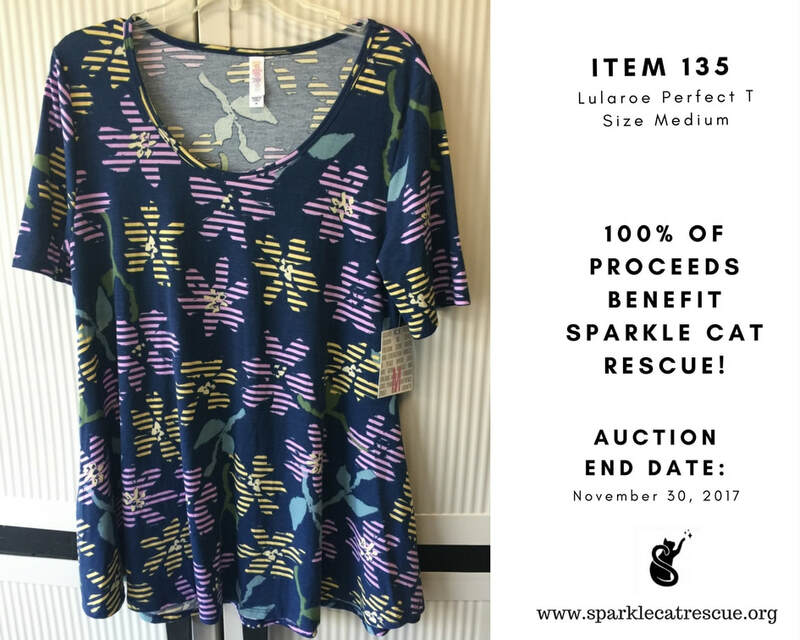 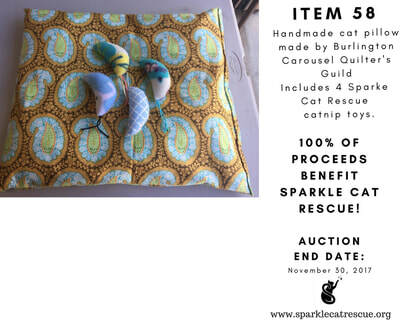 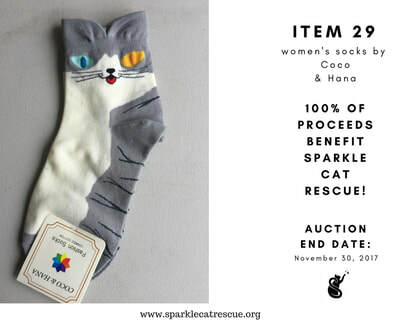 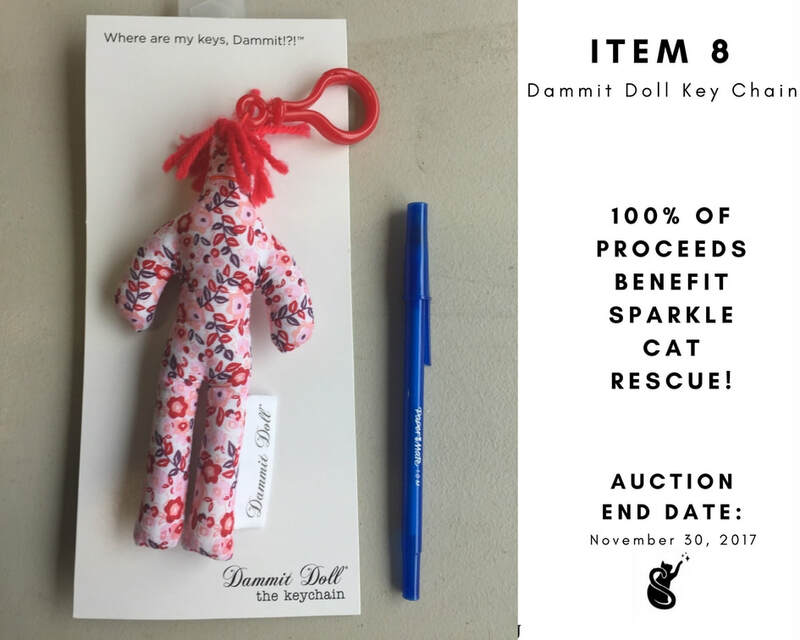 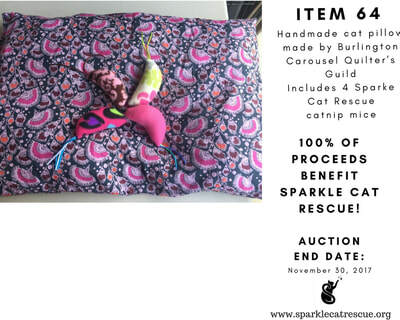 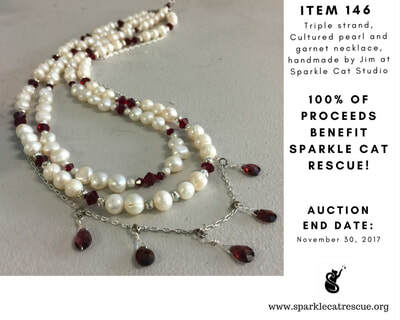 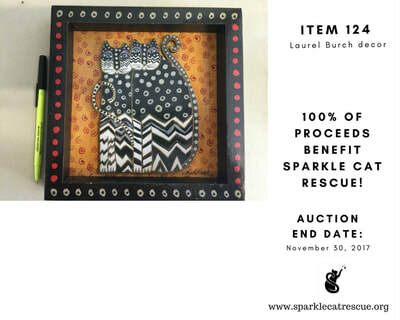 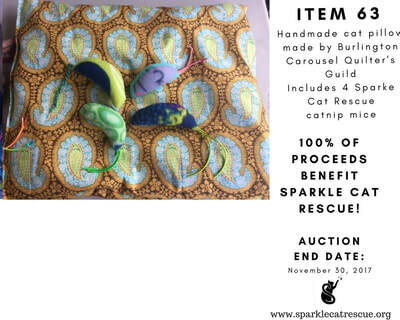 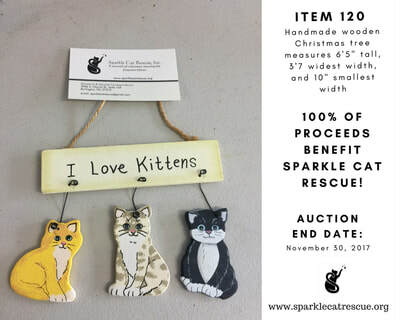 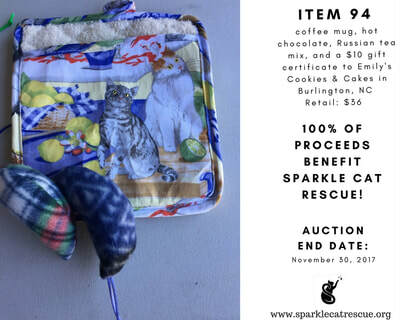 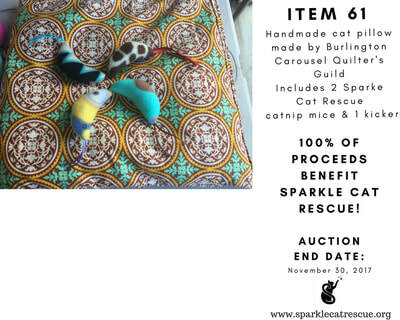 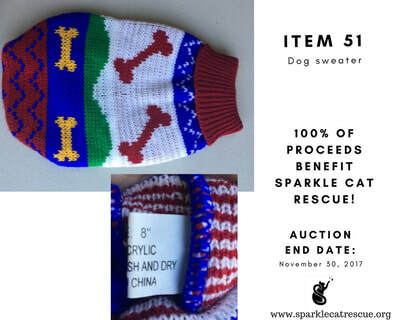 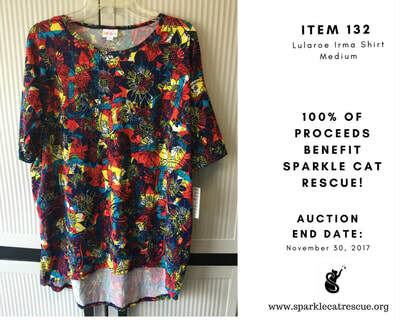 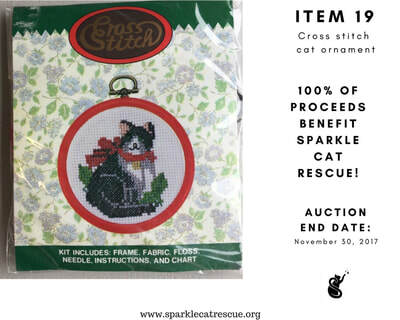 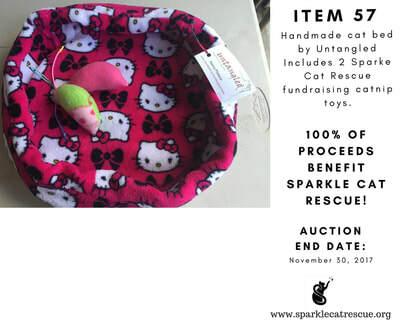 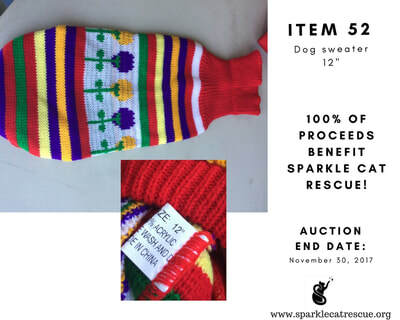 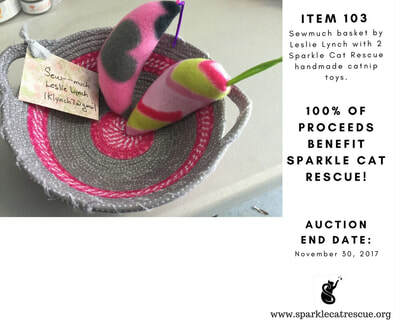 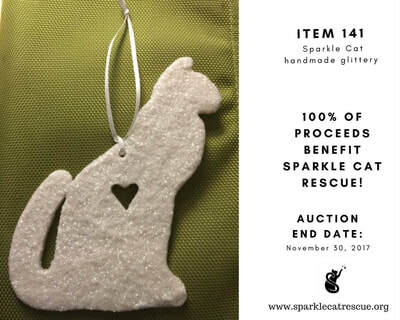 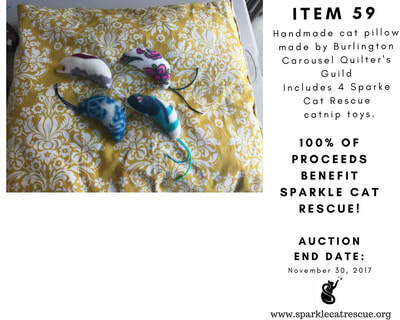 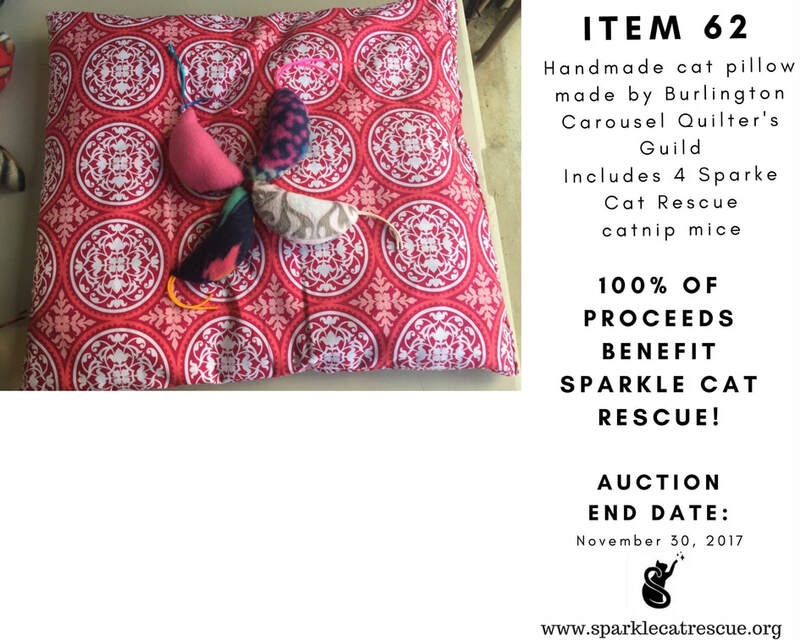 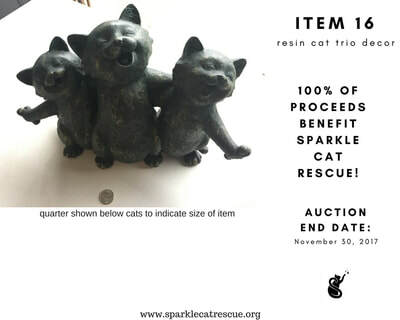 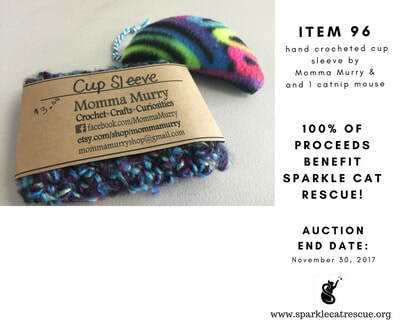 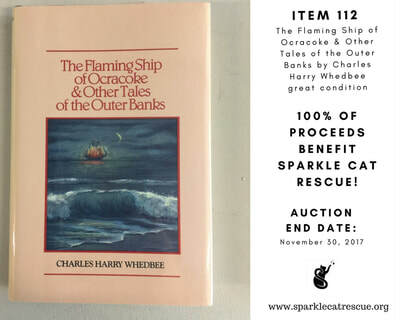 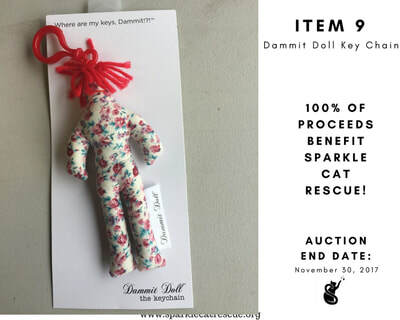 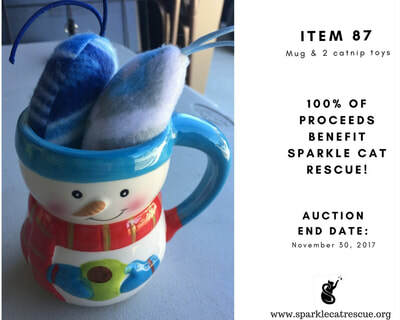 This is a fundraiser to help raise money for Sparkle Cat Rescue's vet bills! 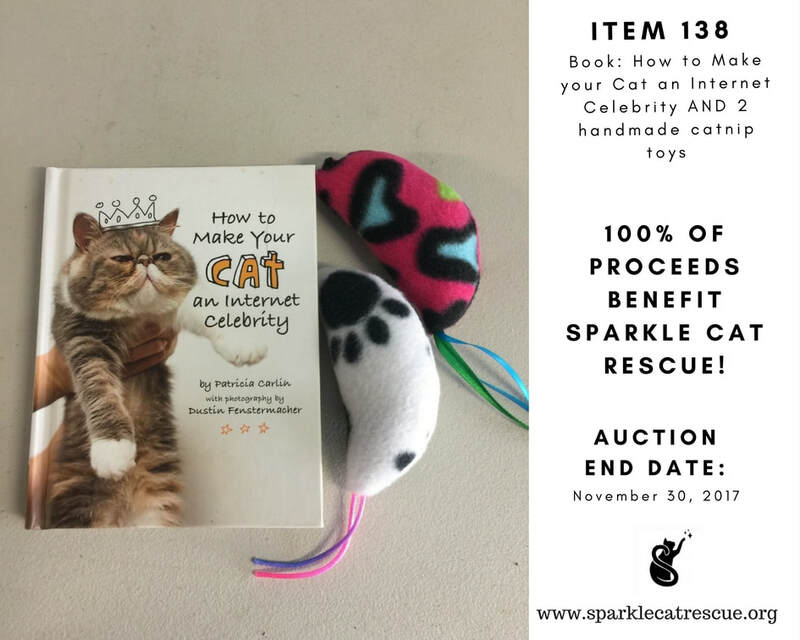 100% of the money raised from items in this album (all donated to our rescue) will help our kitties. Sparke Cat Rescue is 100% volunteer (ZERO paid employees). 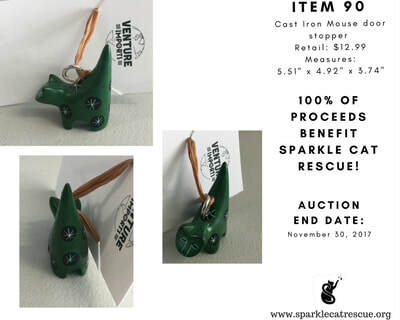 We are a 501 (c) (3) nonprofit organization founded November 6, 2014. Since that time, we have rescued over 460 cats in our community and adopted out over 300 to forever homes. 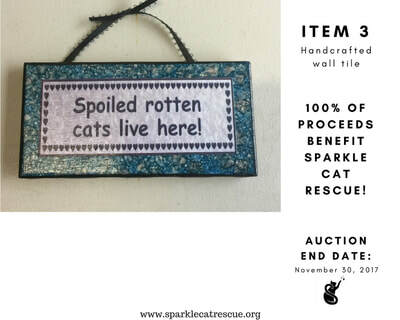 Our mission is saving the 'forgotten felines': abandoned, abused, homeless, injured, neglected. 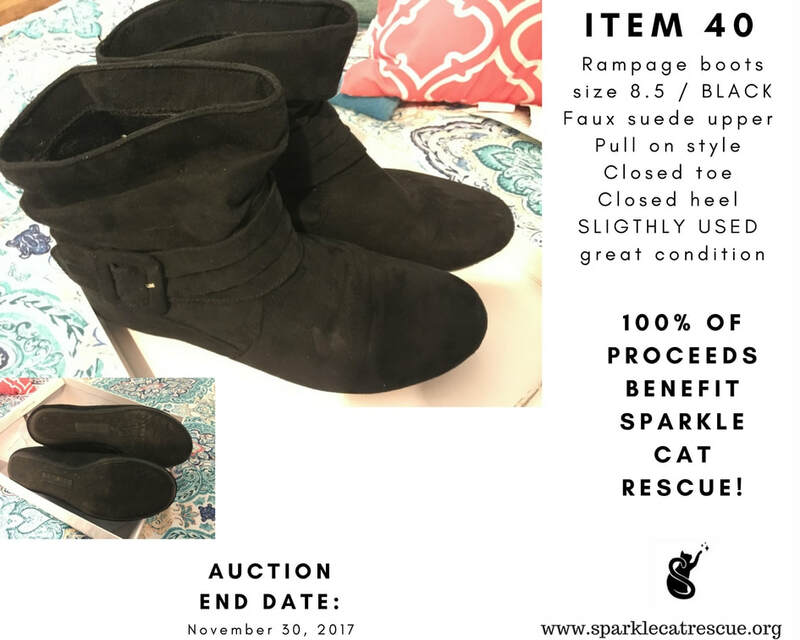 Please click above button link to be directed to Facebook to bid on items in the online fundraising group. 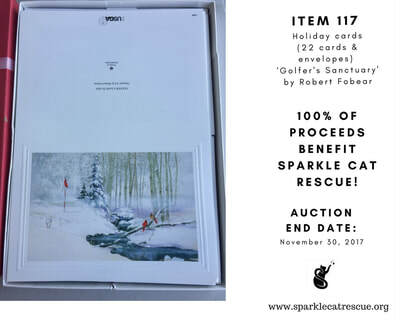 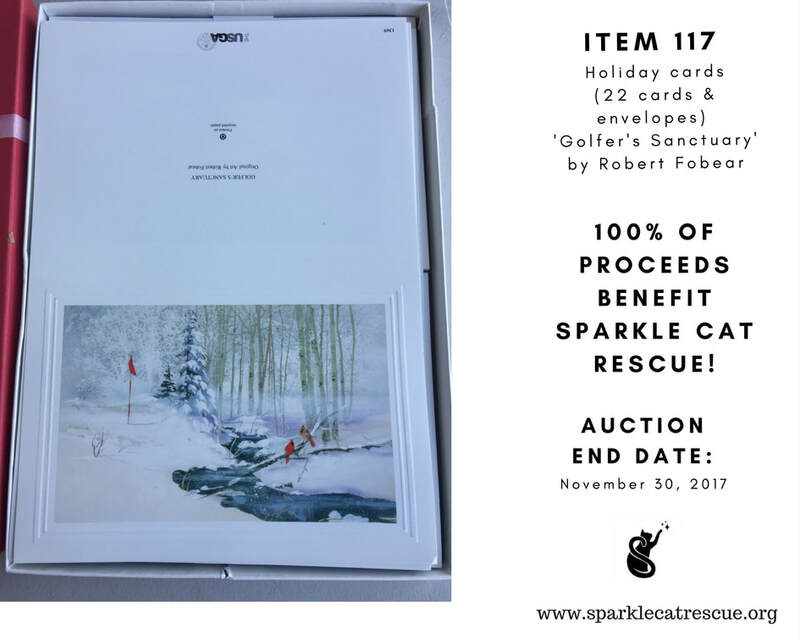 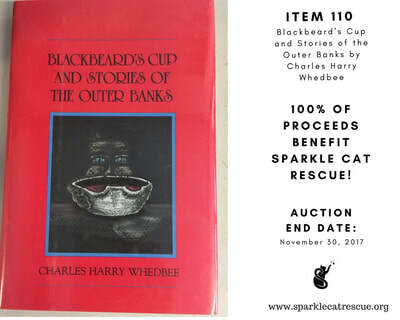 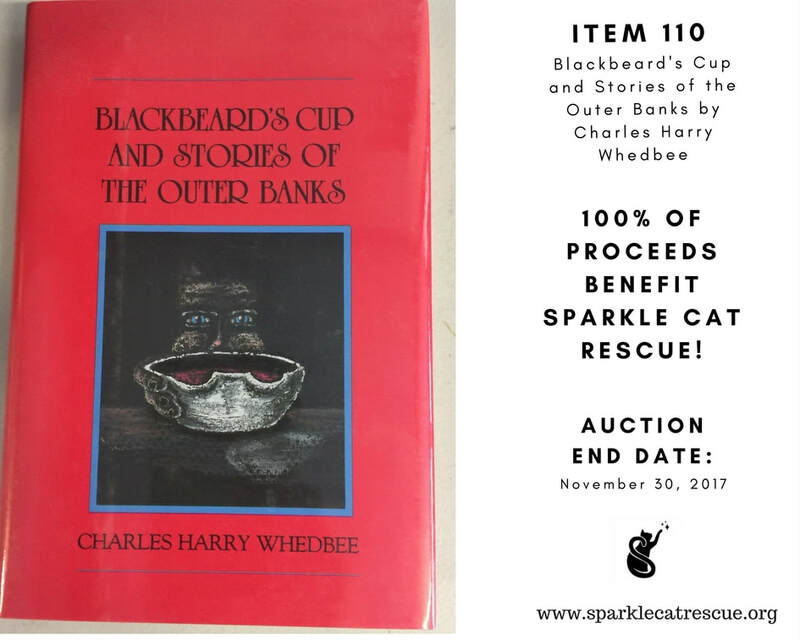 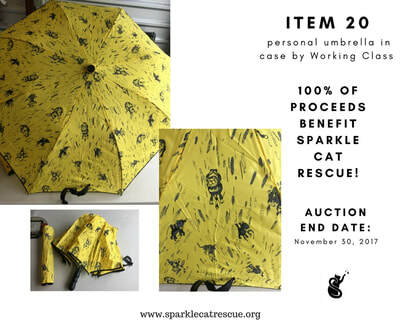 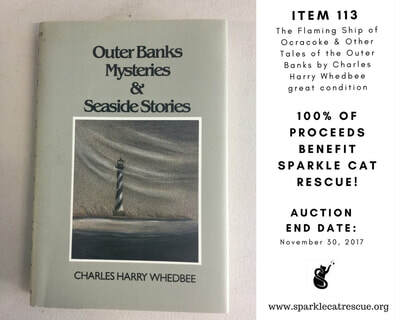 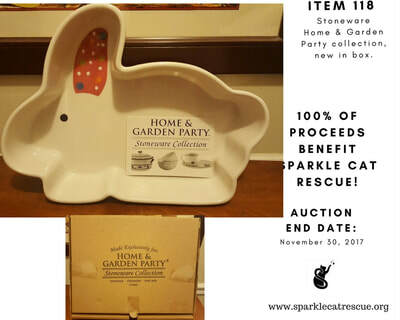 ​Below are photos of items in the auction. 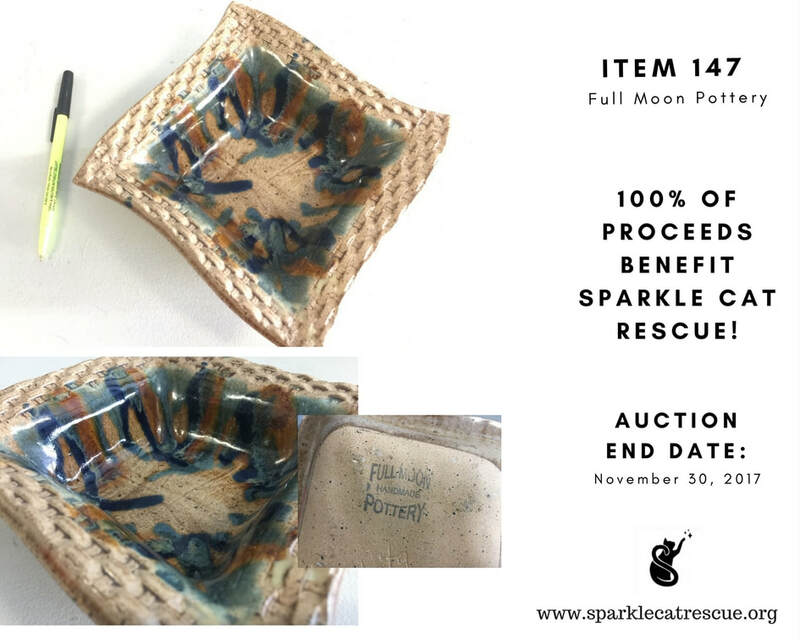 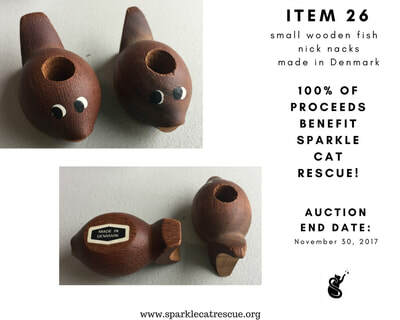 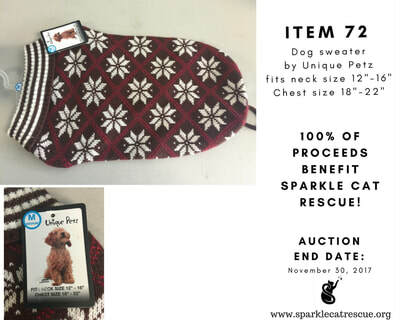 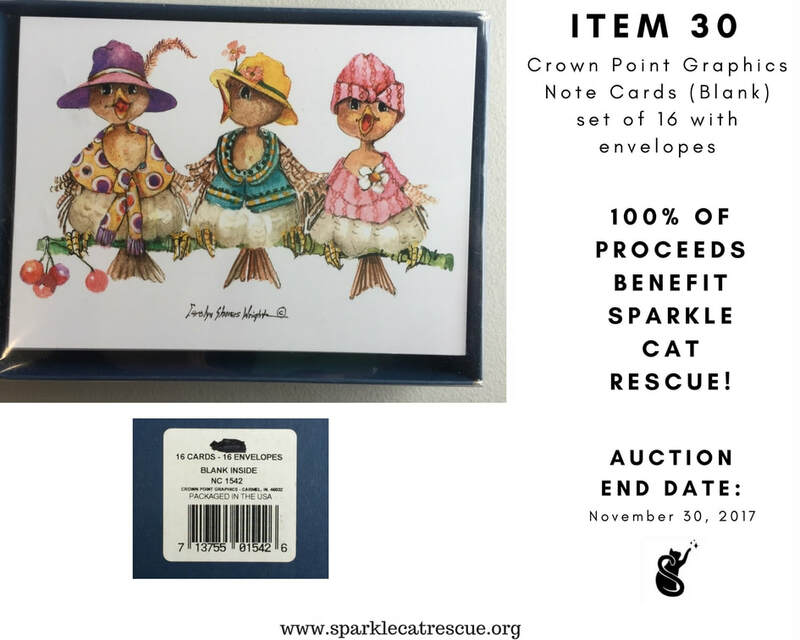 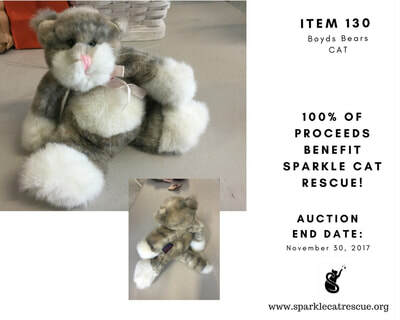 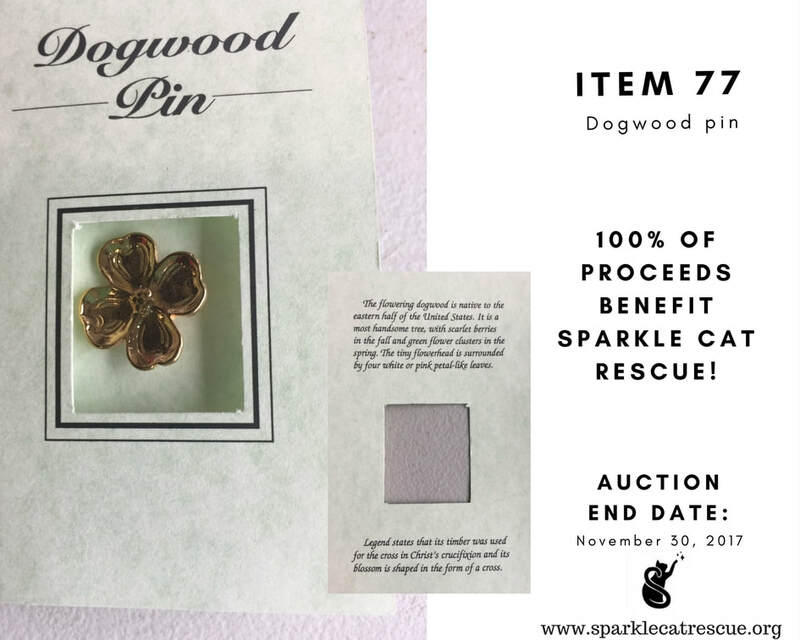 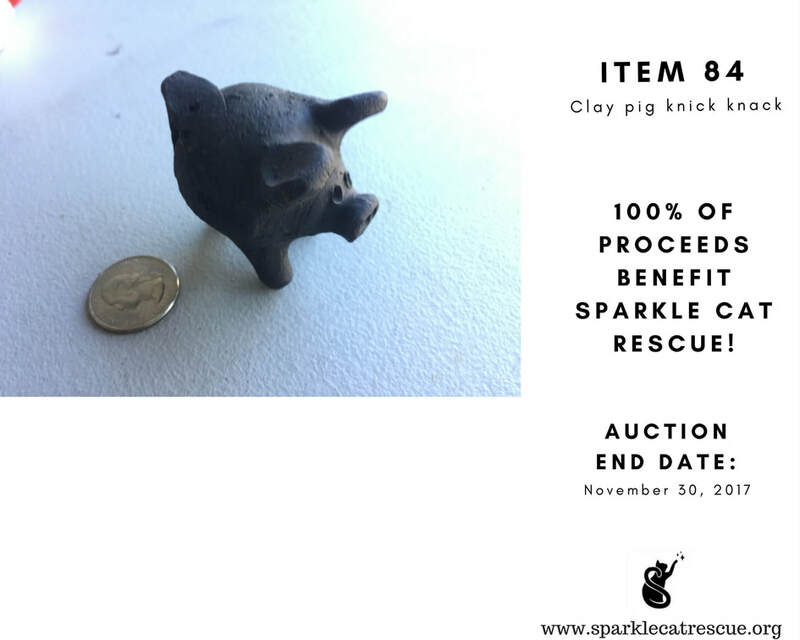 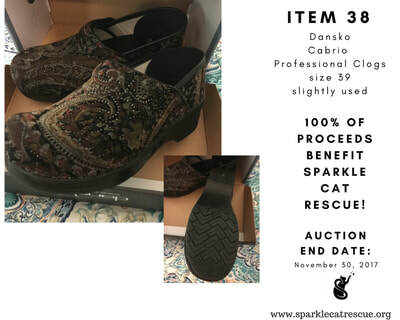 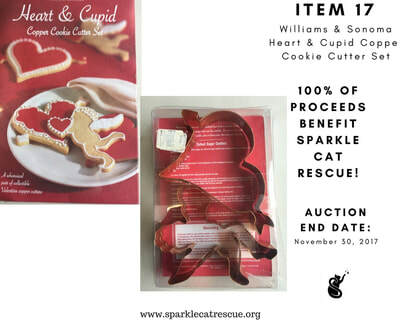 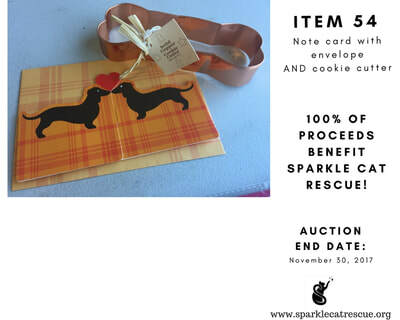 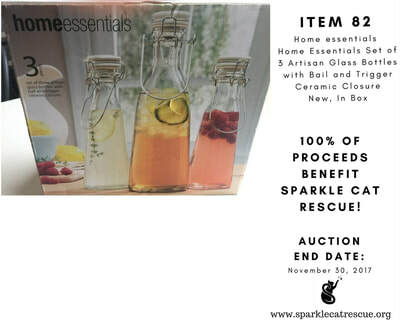 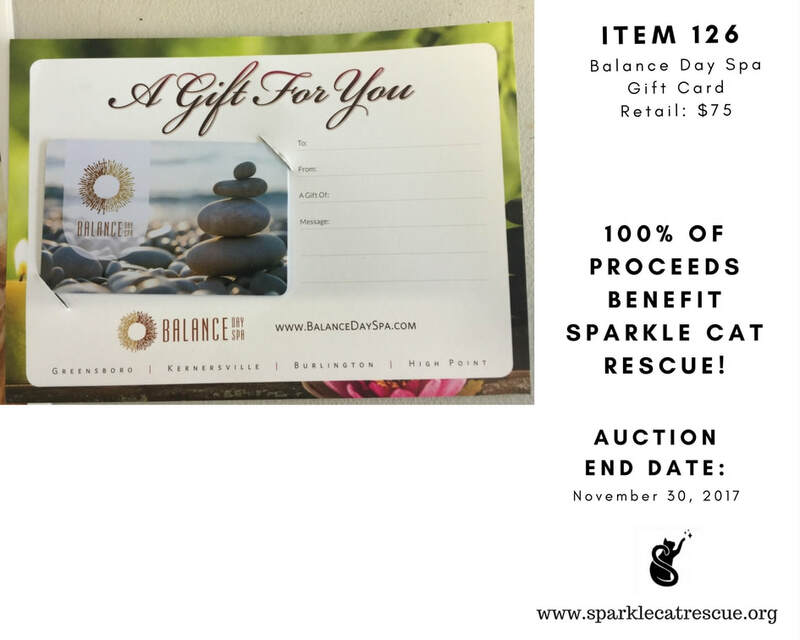 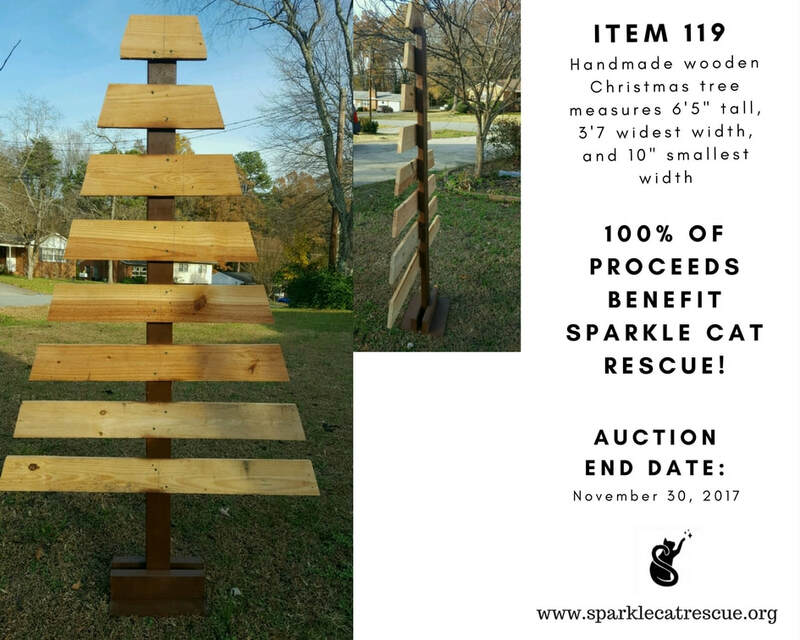 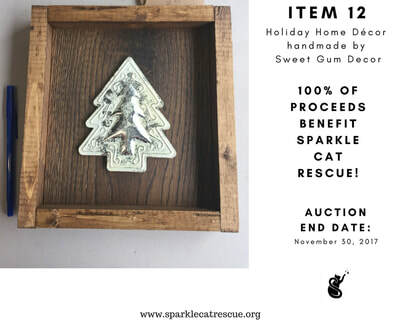 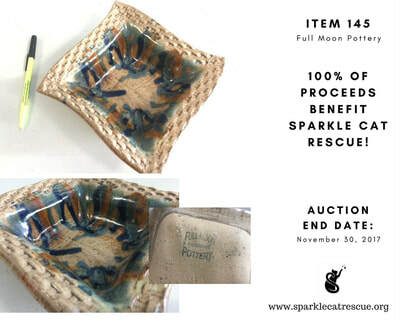 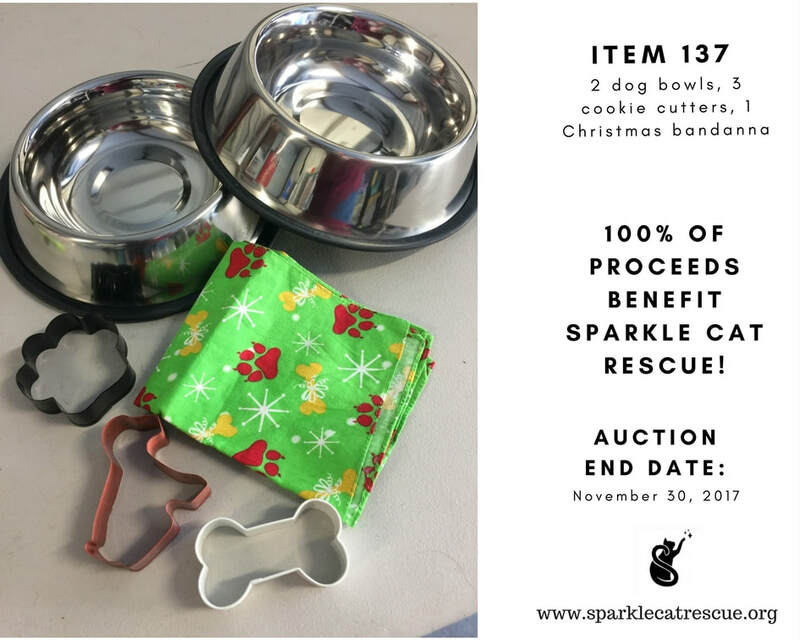 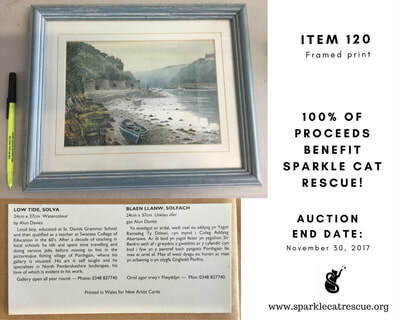 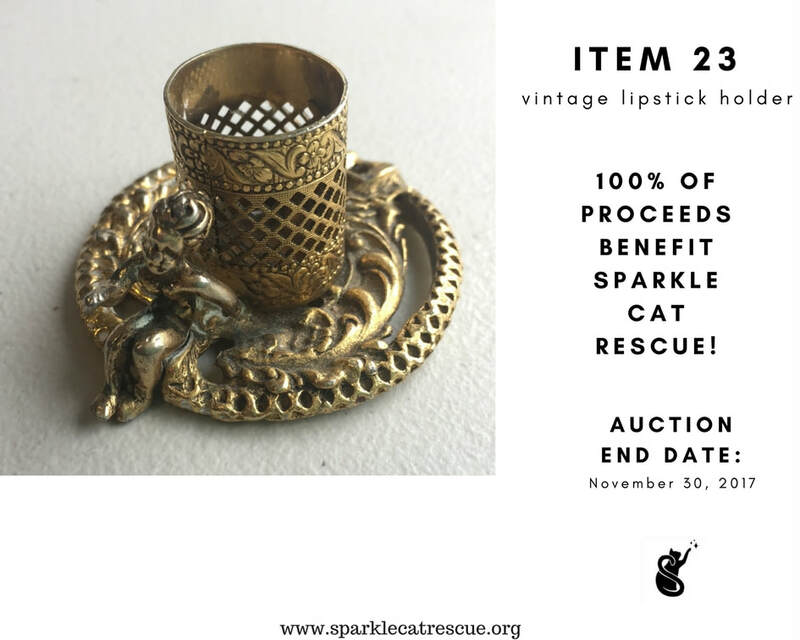 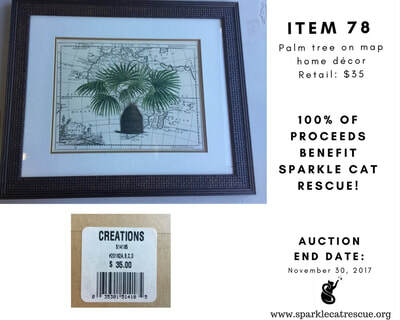 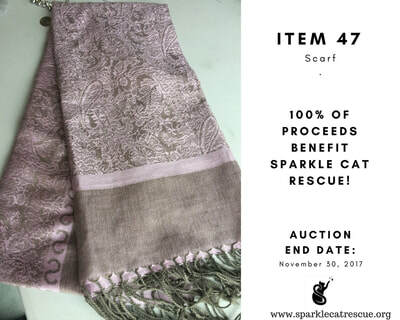 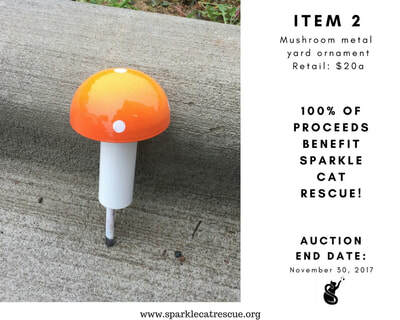 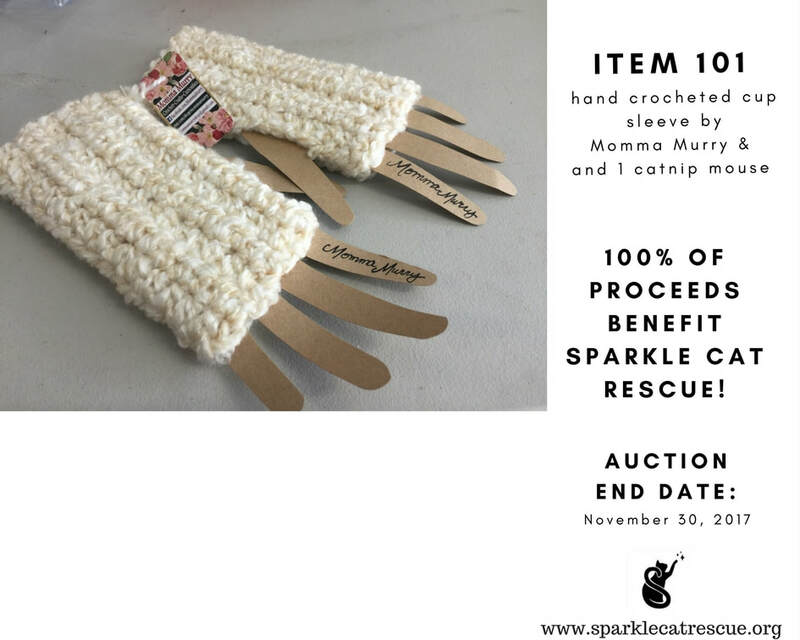 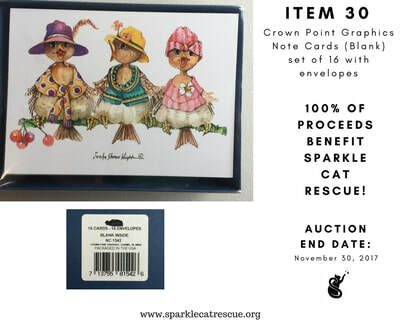 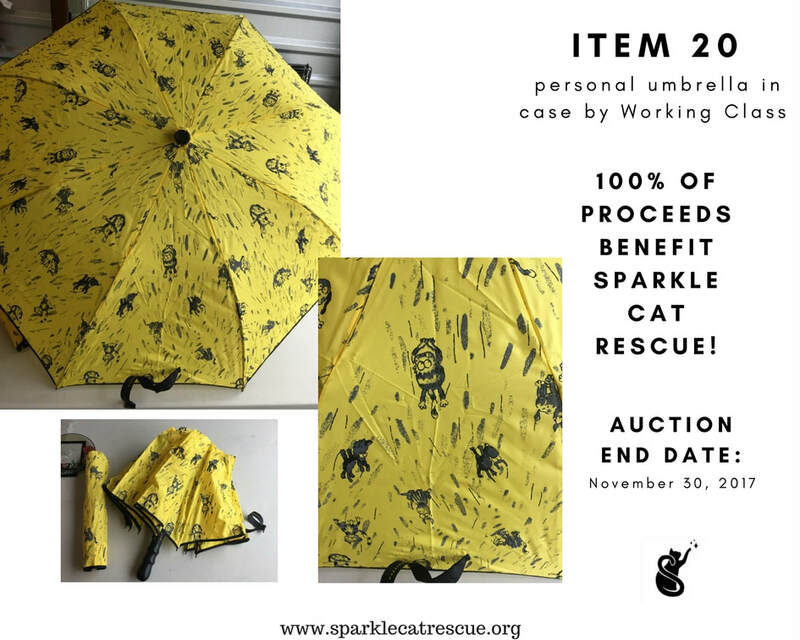 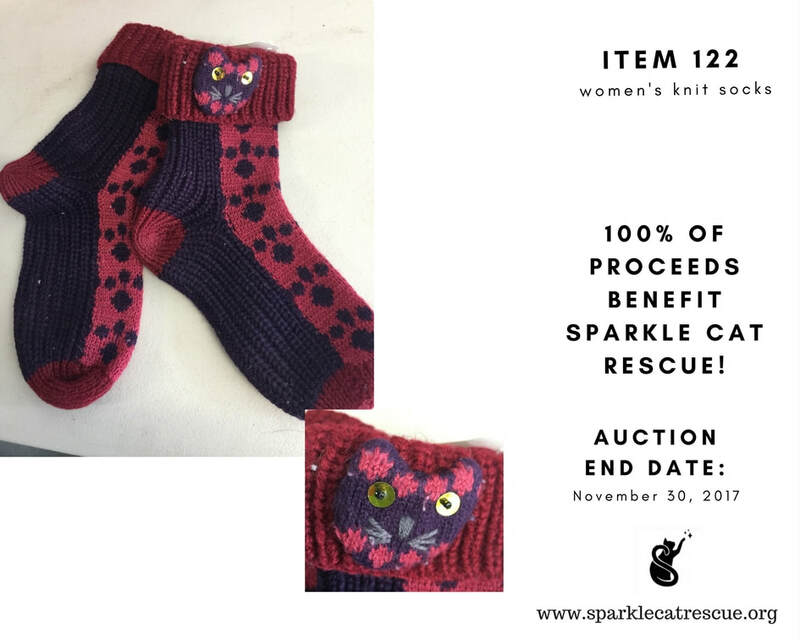 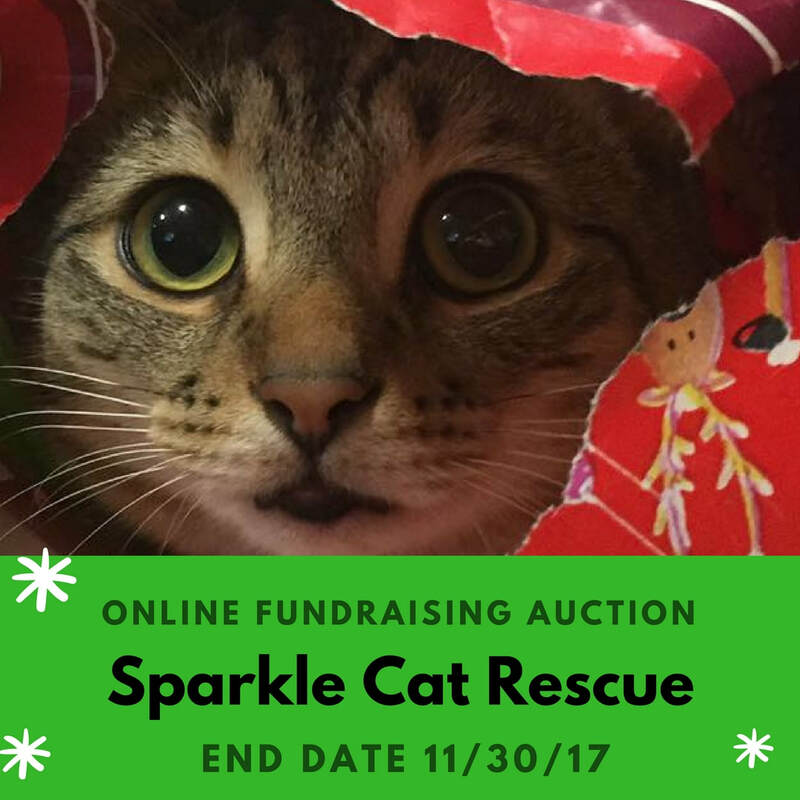 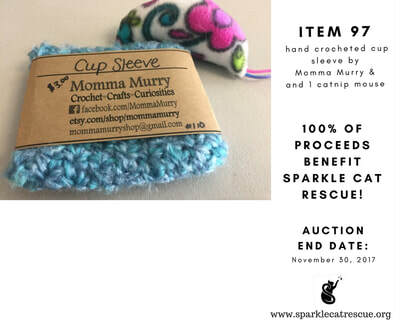 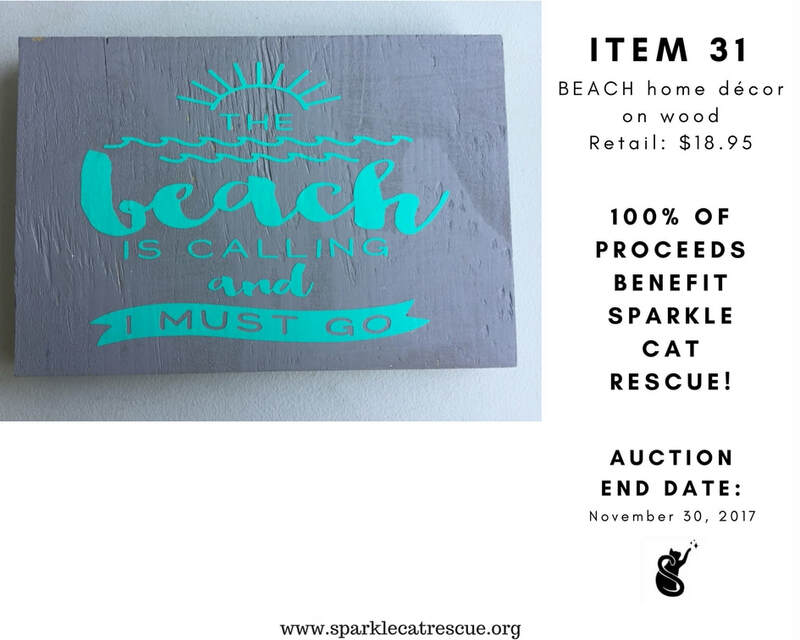 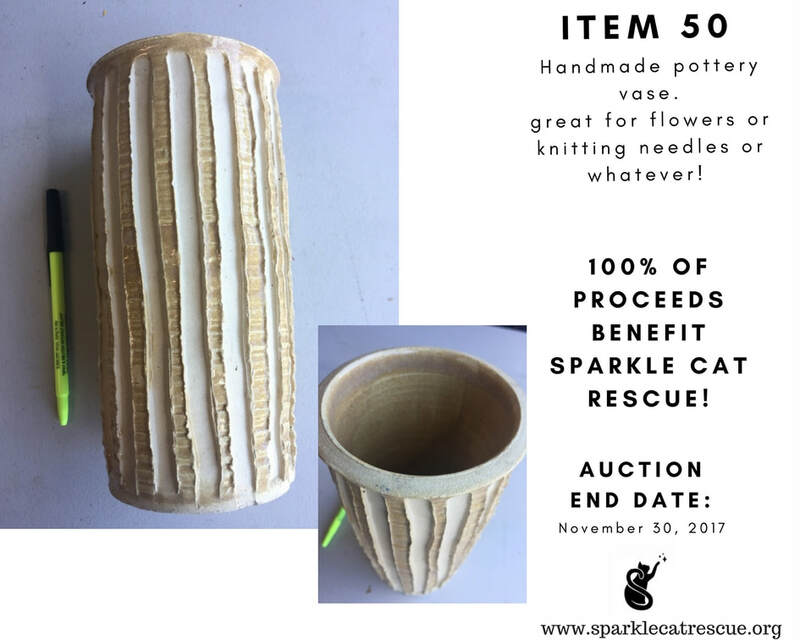 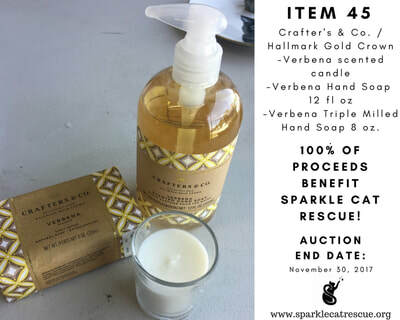 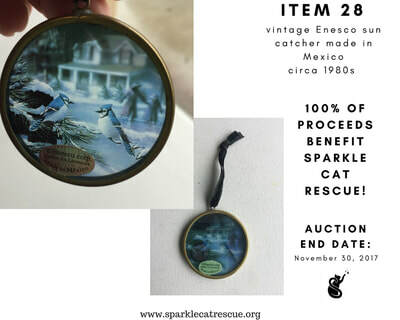 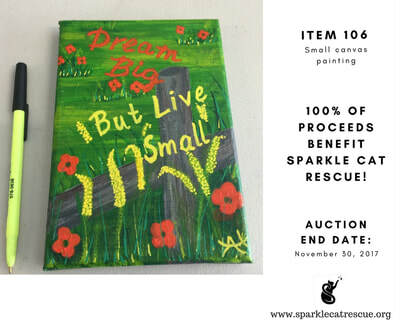 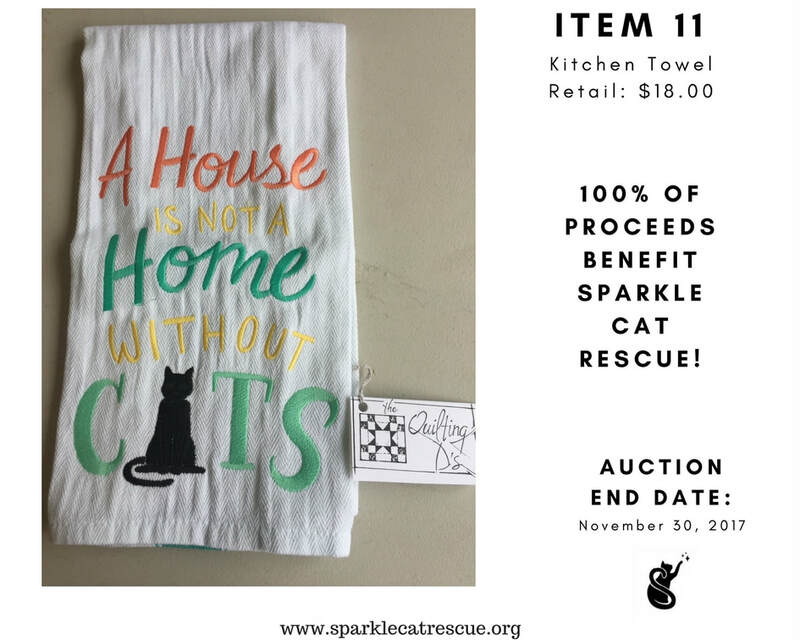 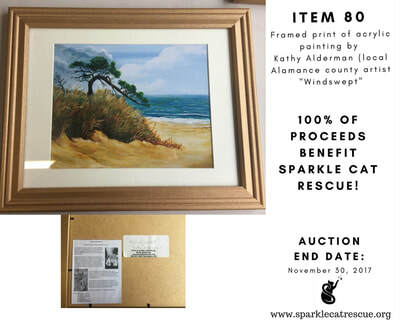 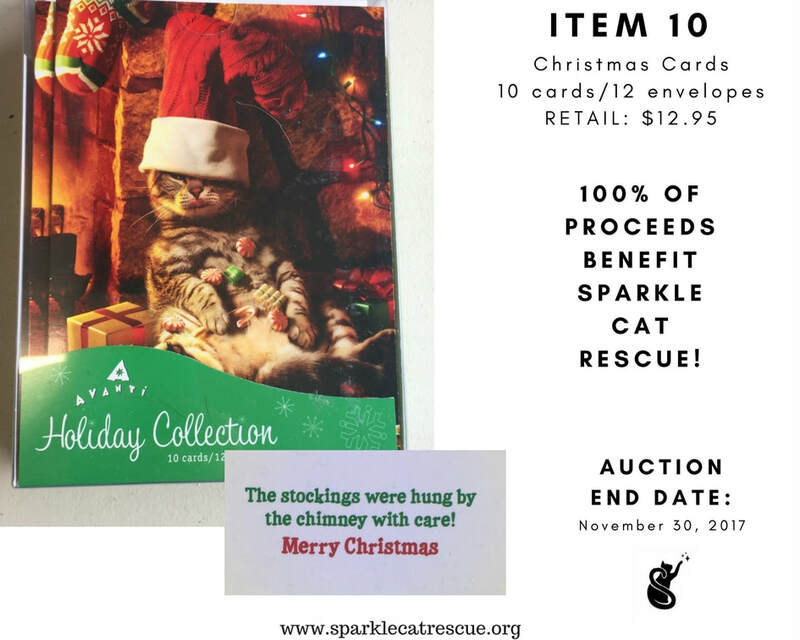 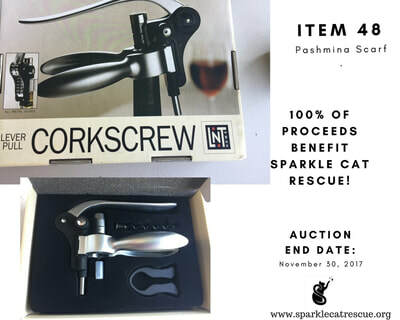 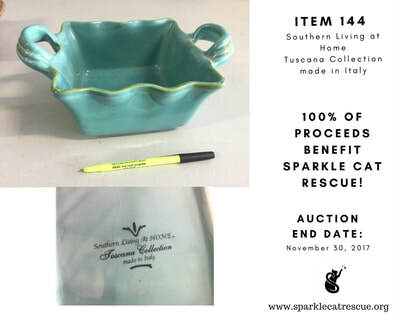 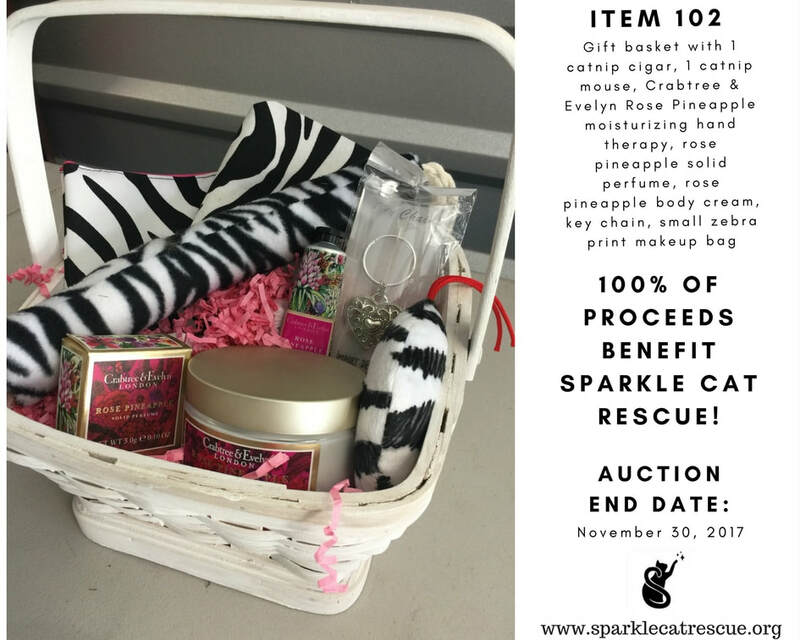 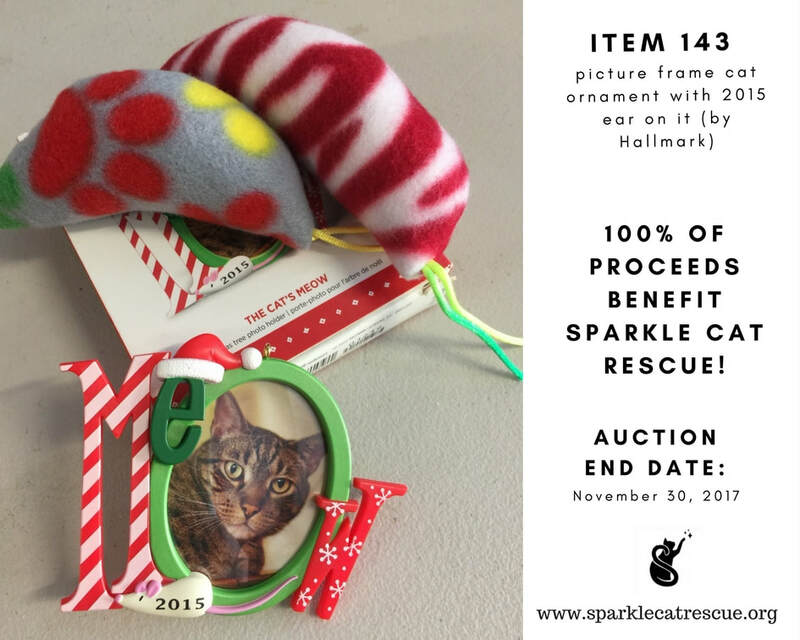 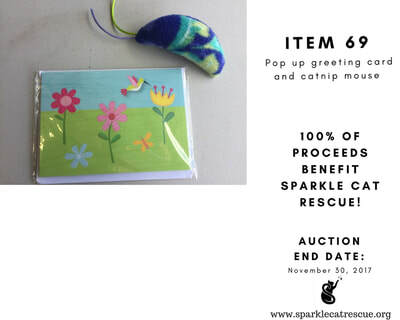 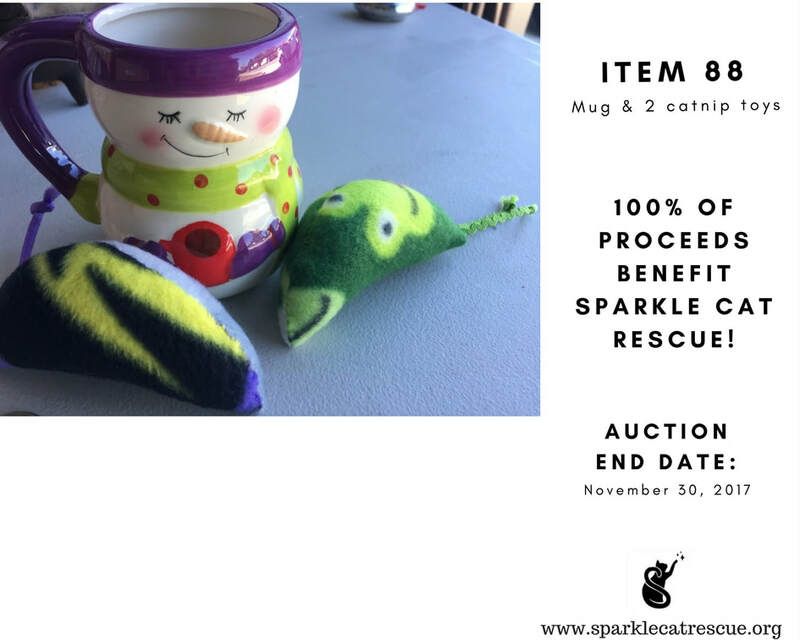 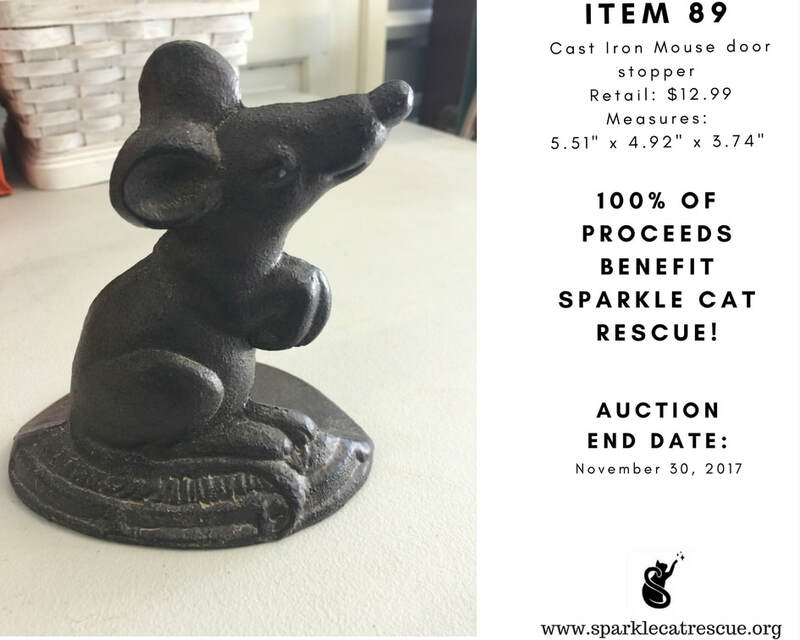 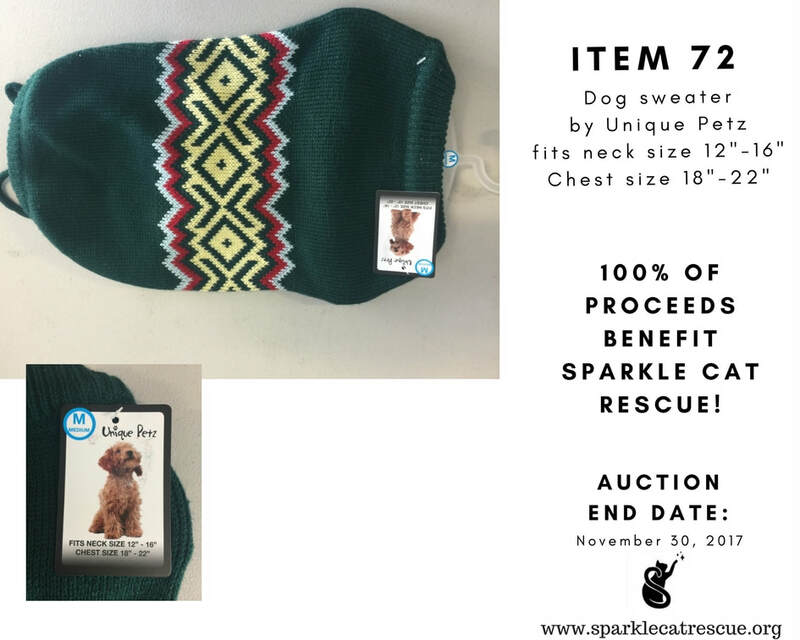 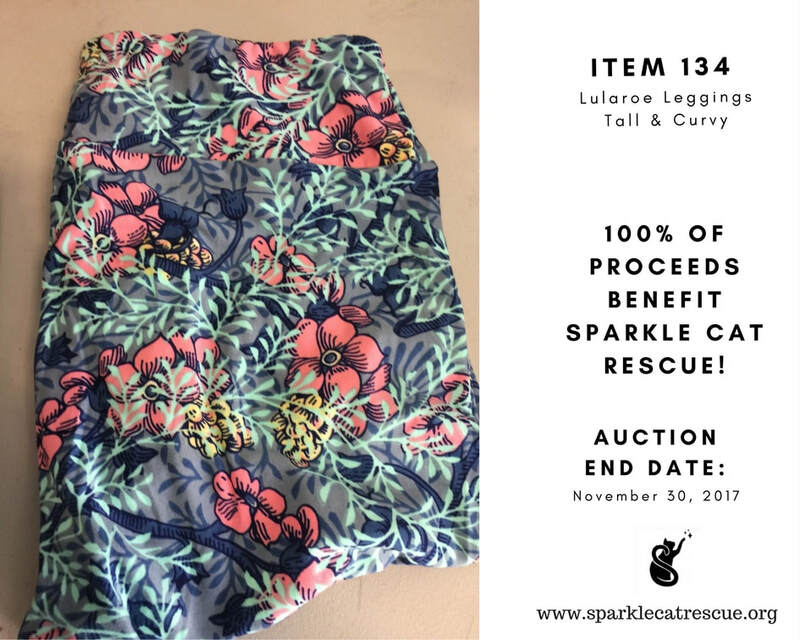 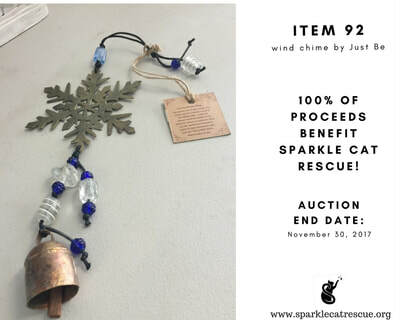 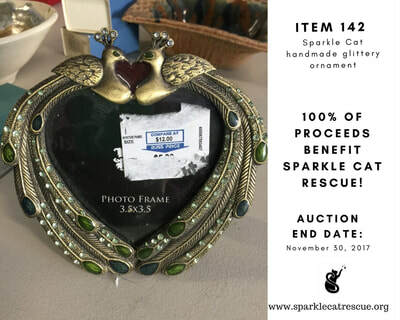 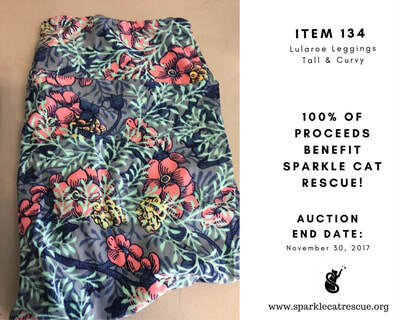 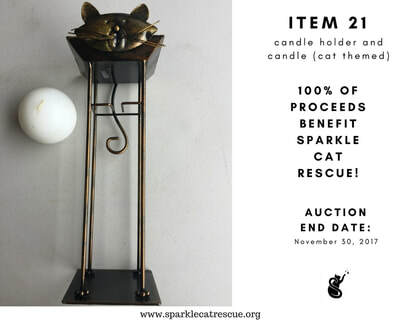 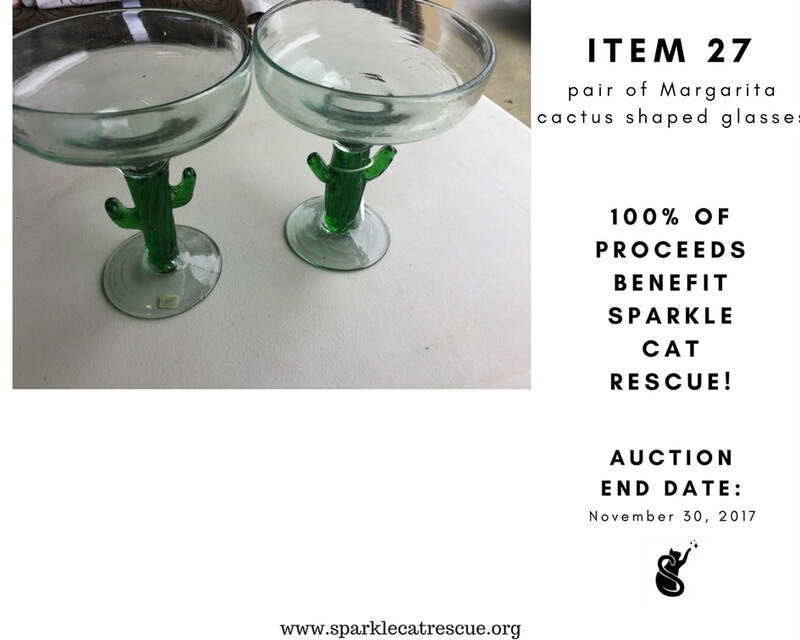 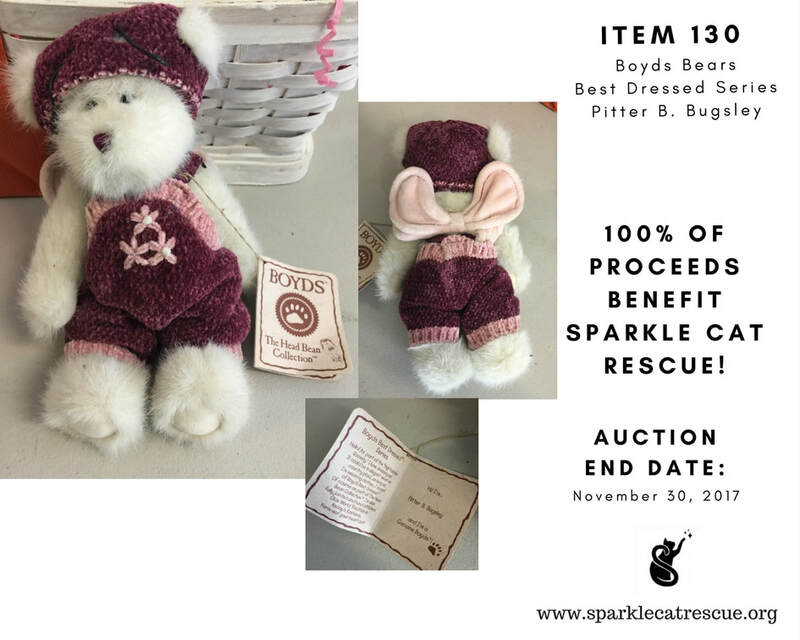 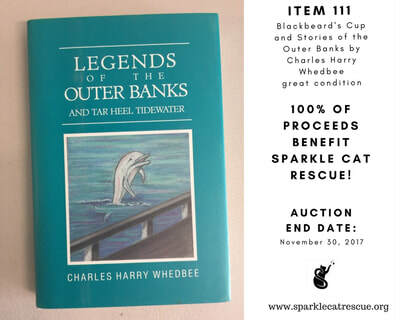 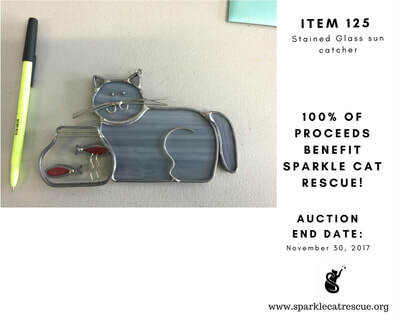 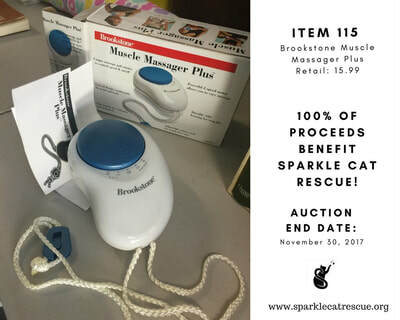 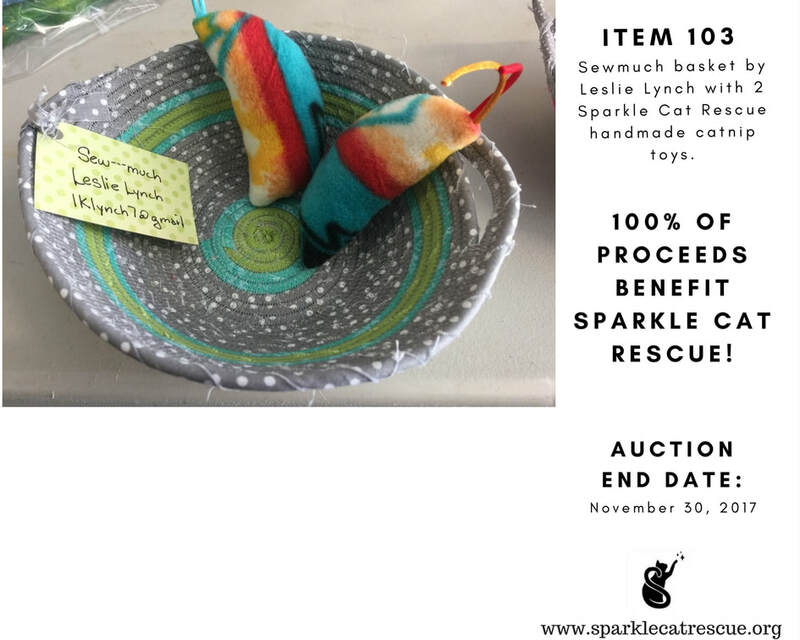 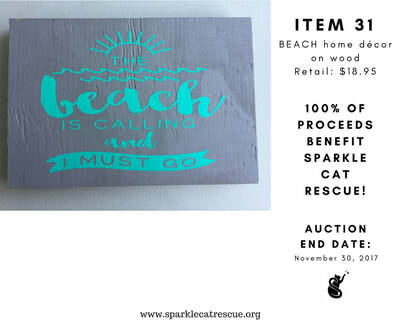 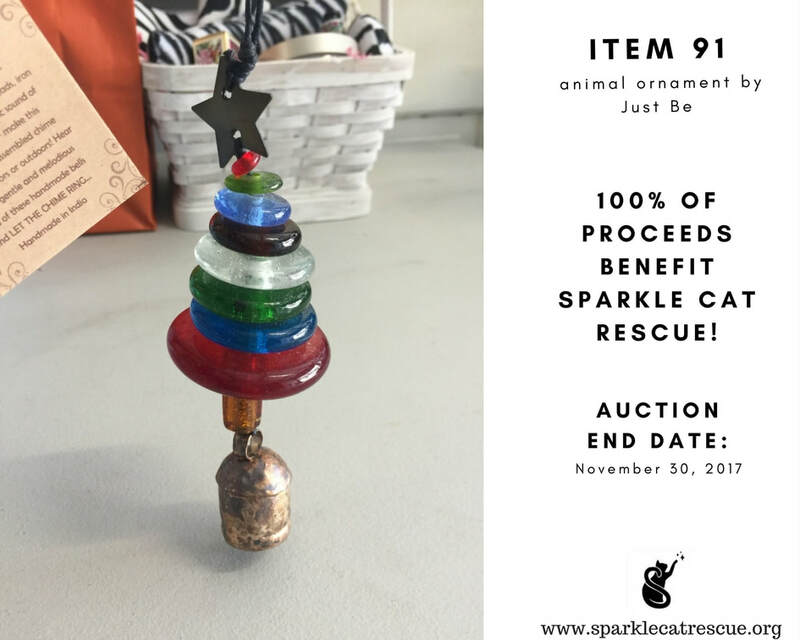 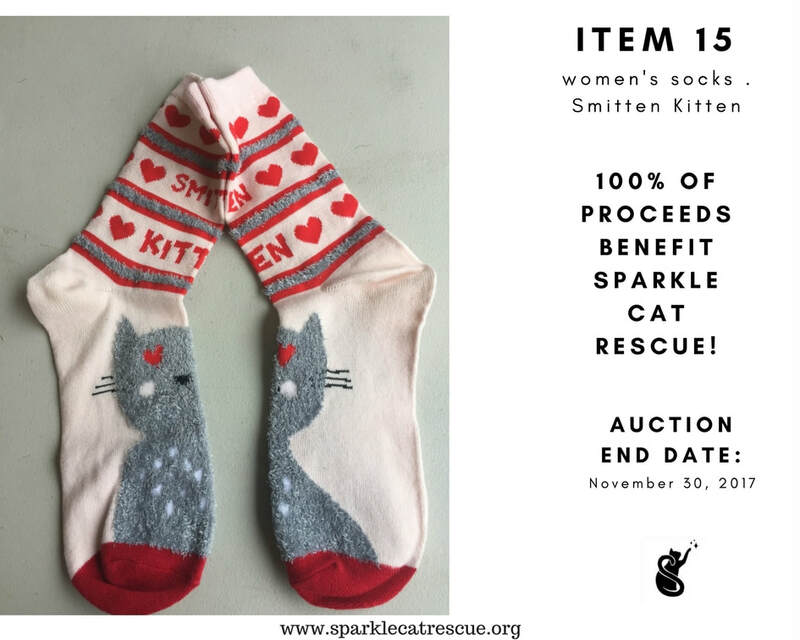 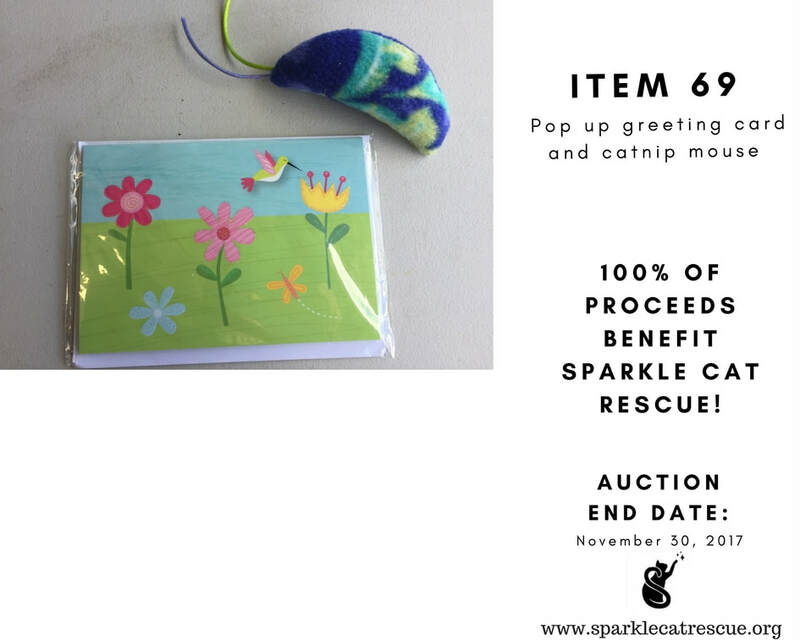 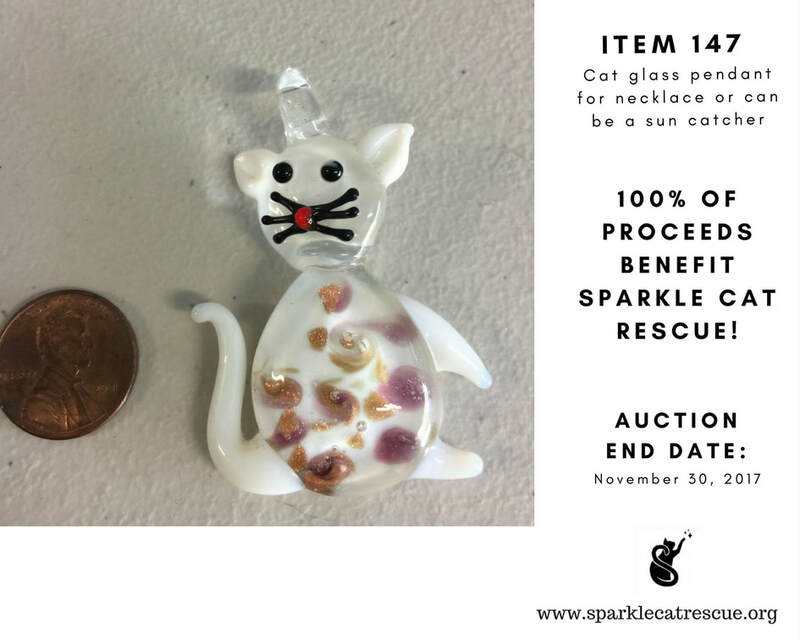 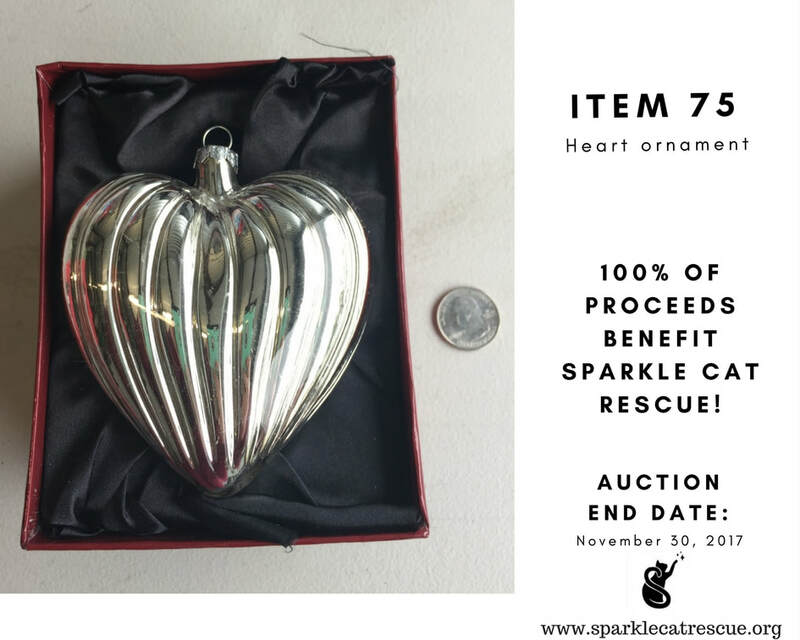 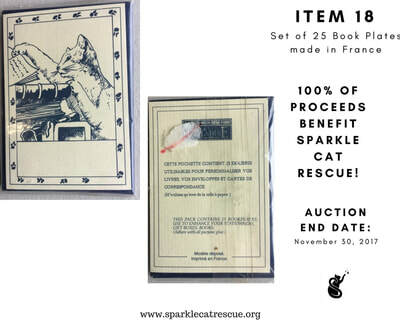 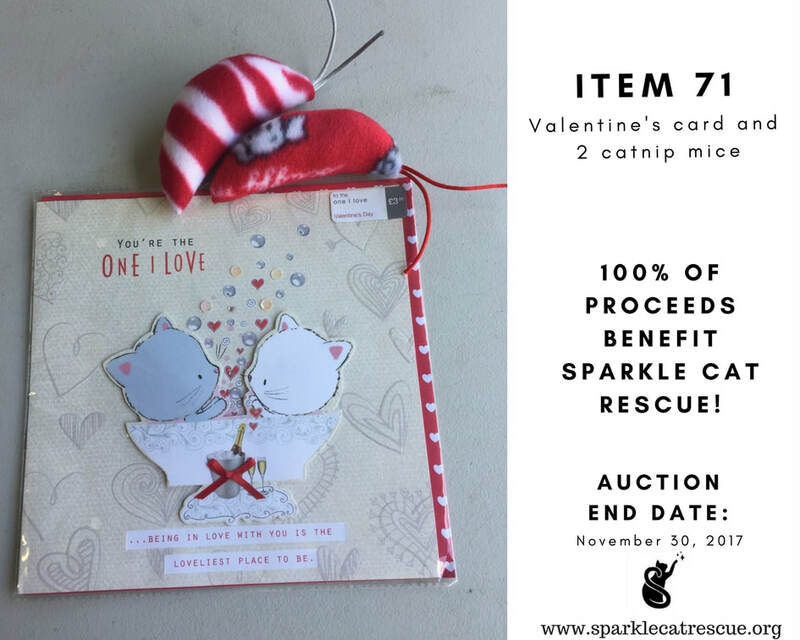 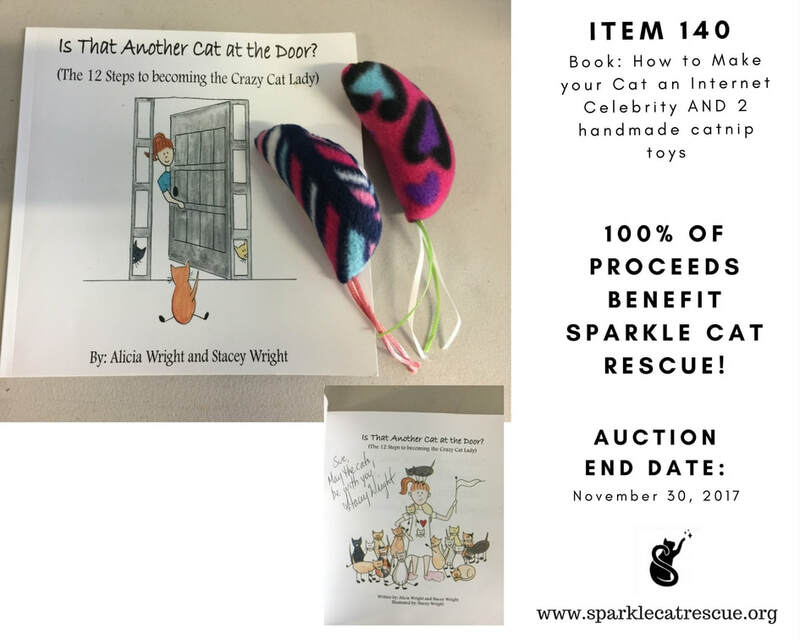 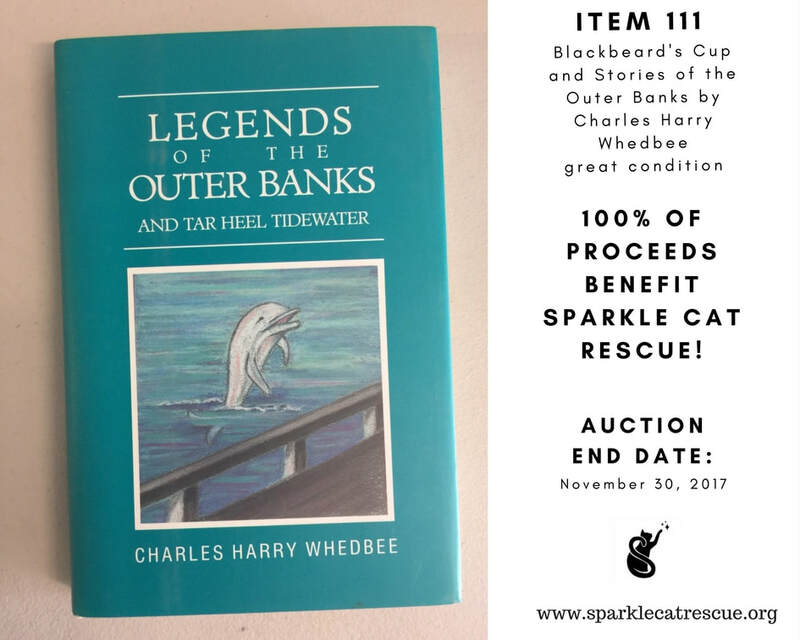 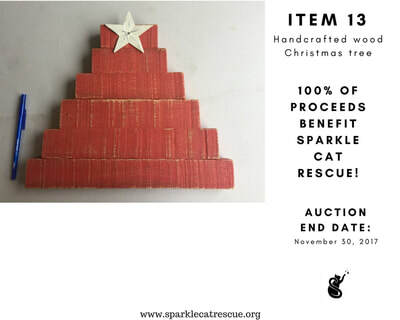 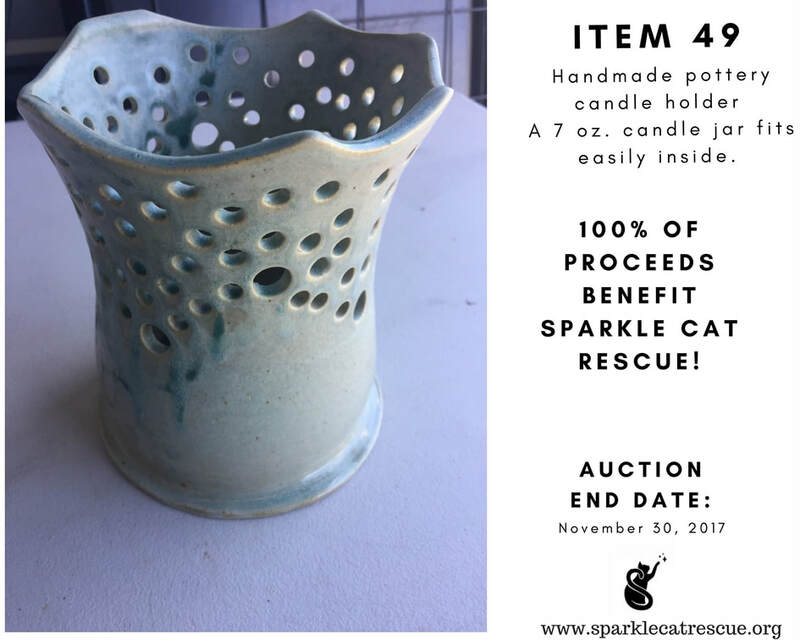 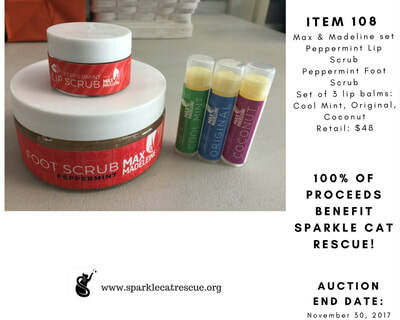 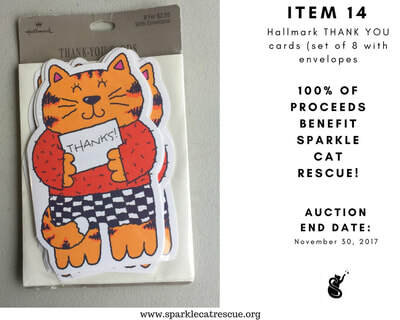 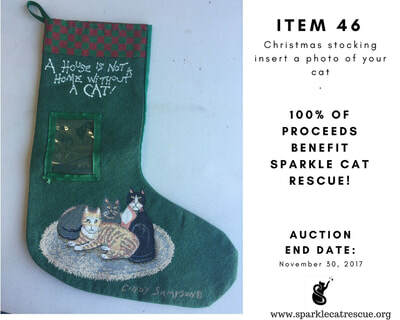 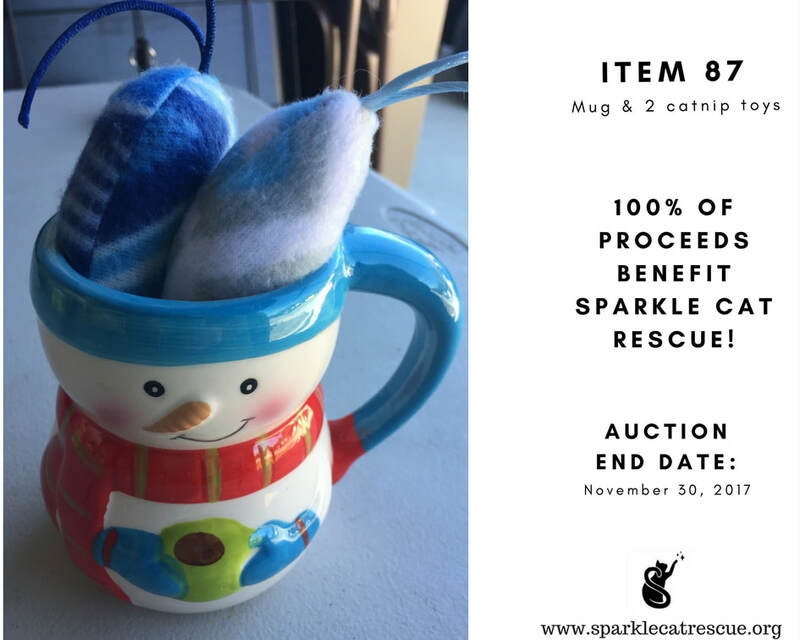 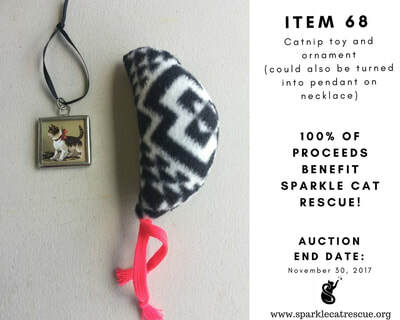 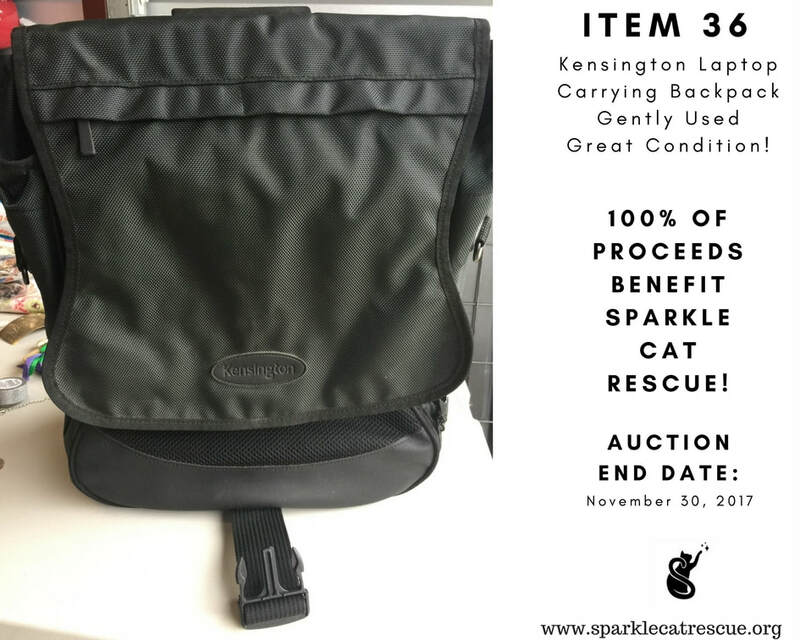 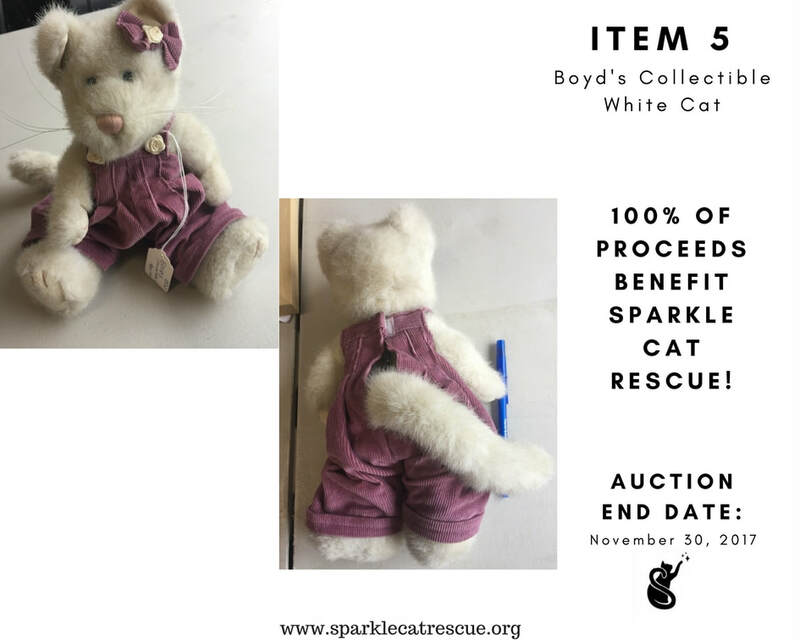 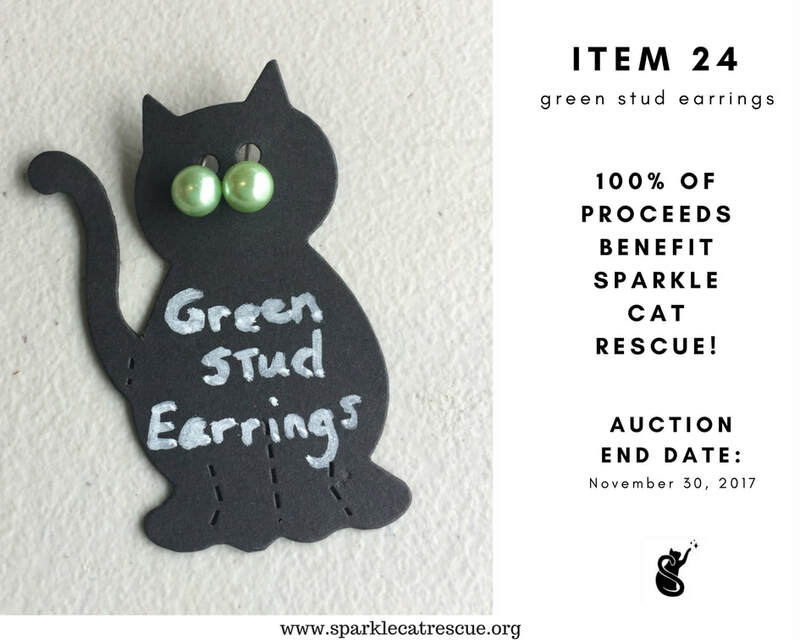 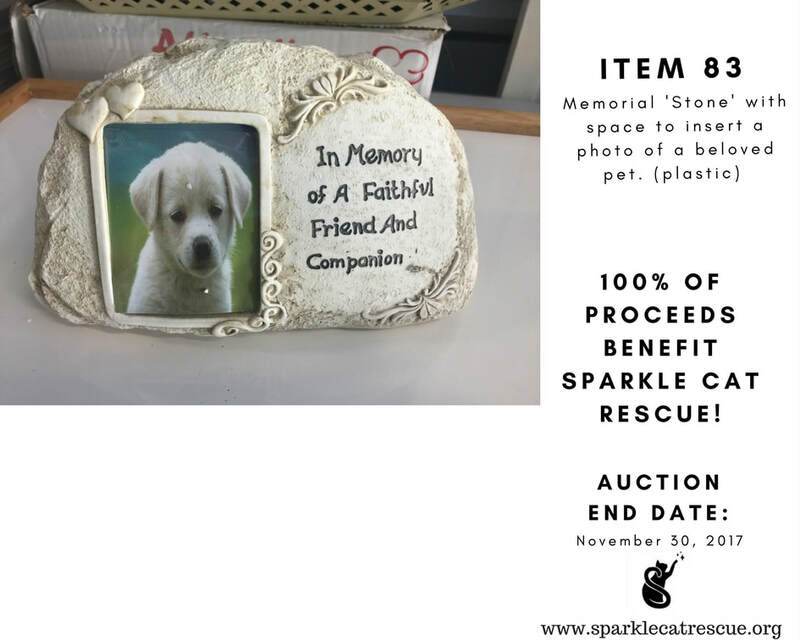 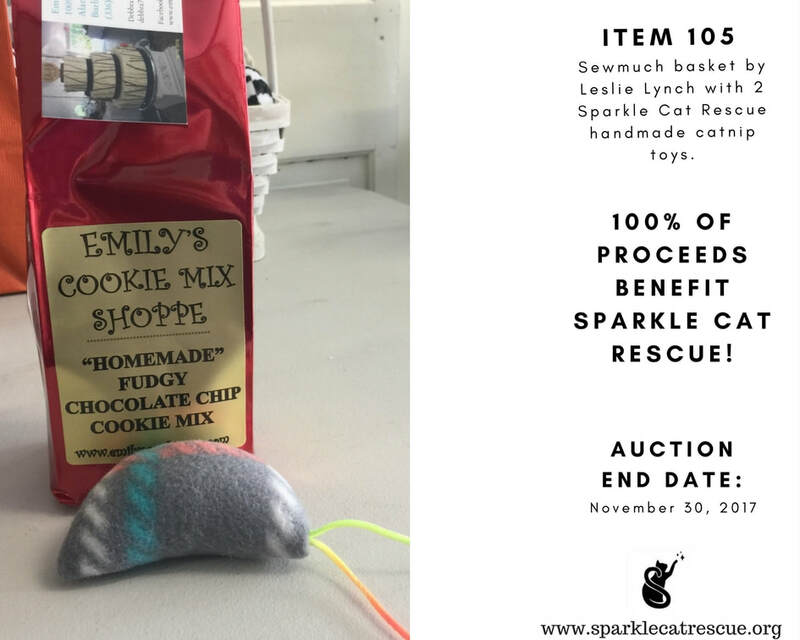 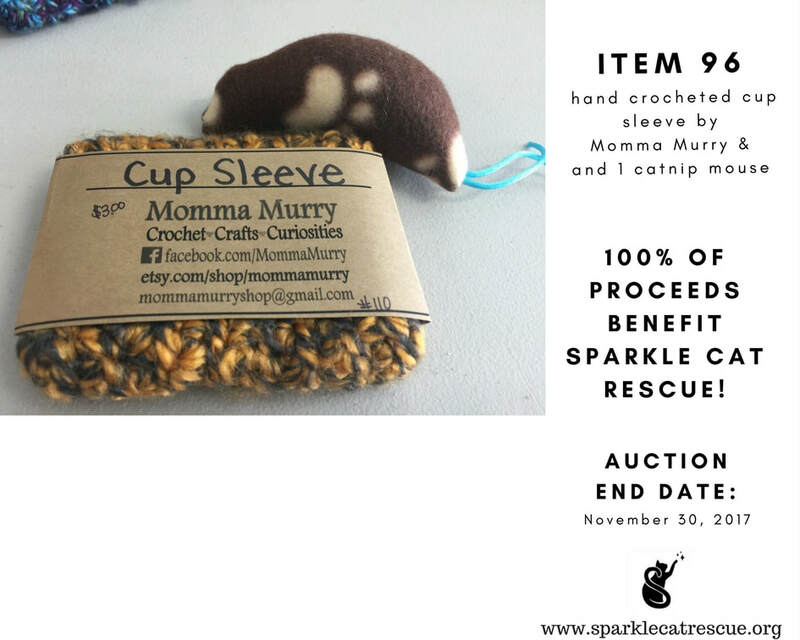 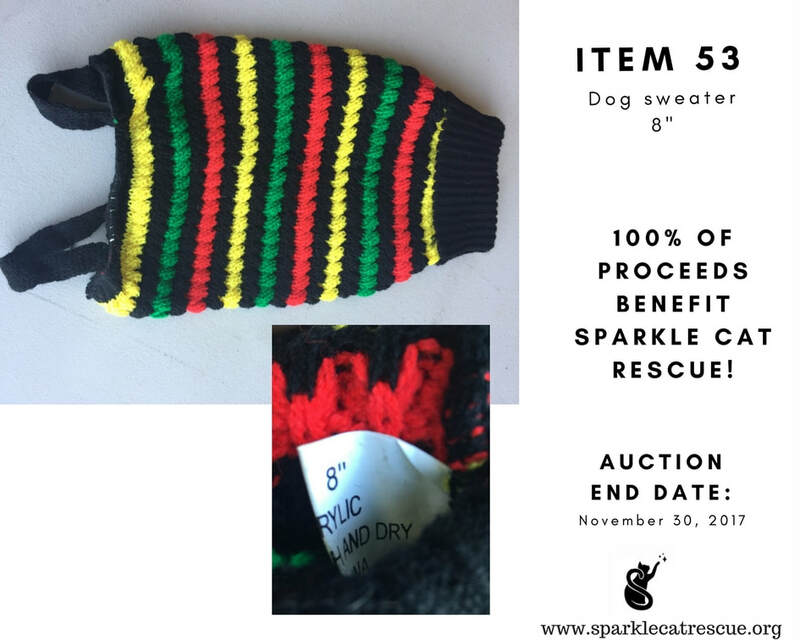 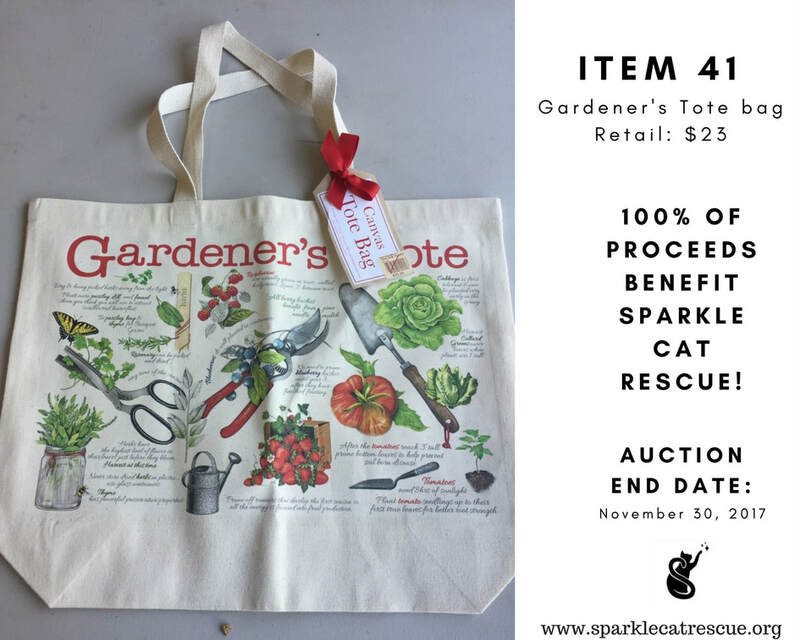 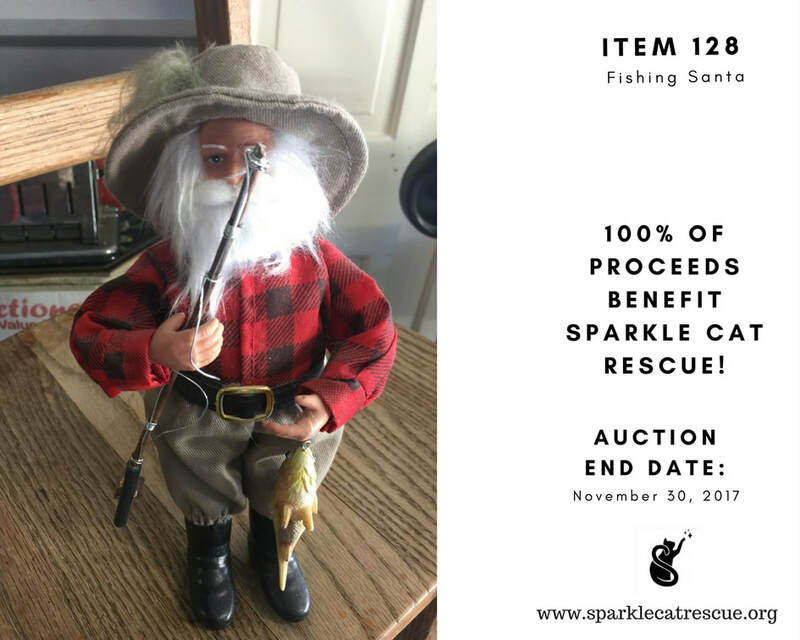 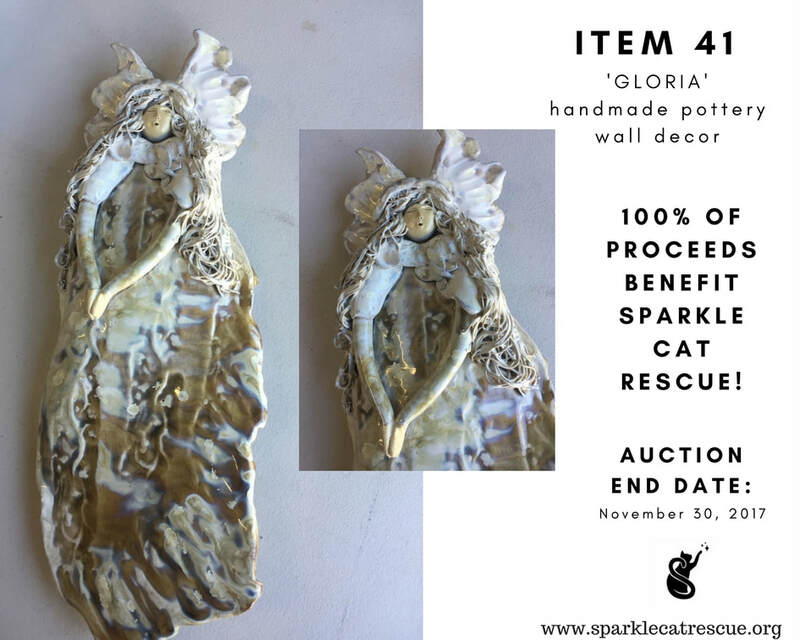 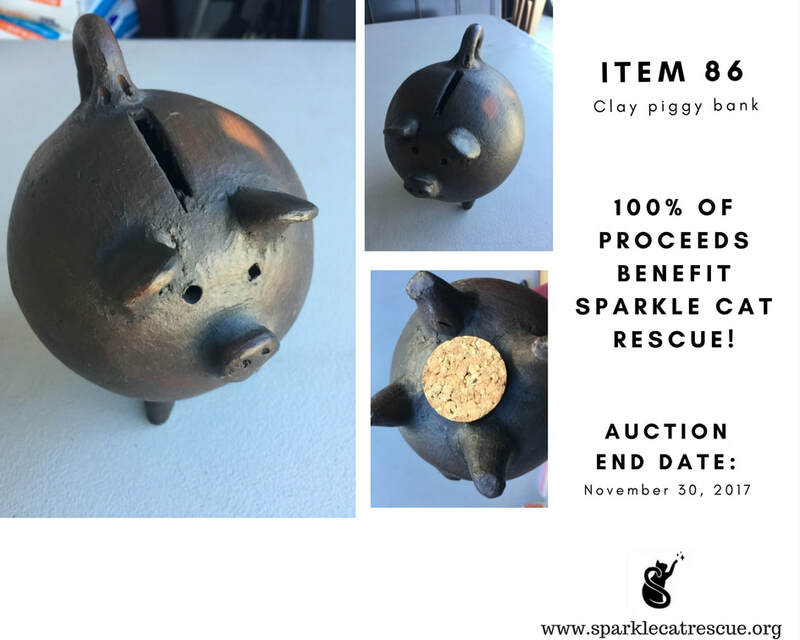 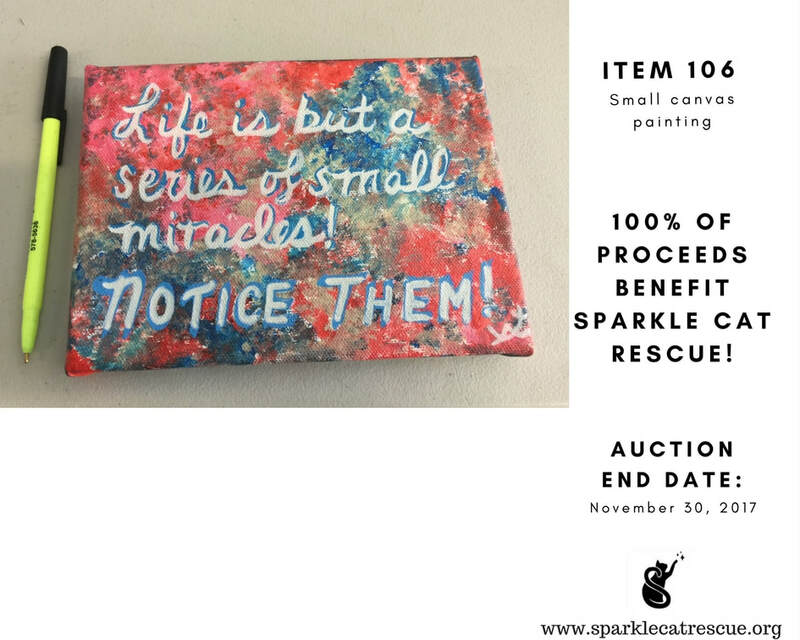 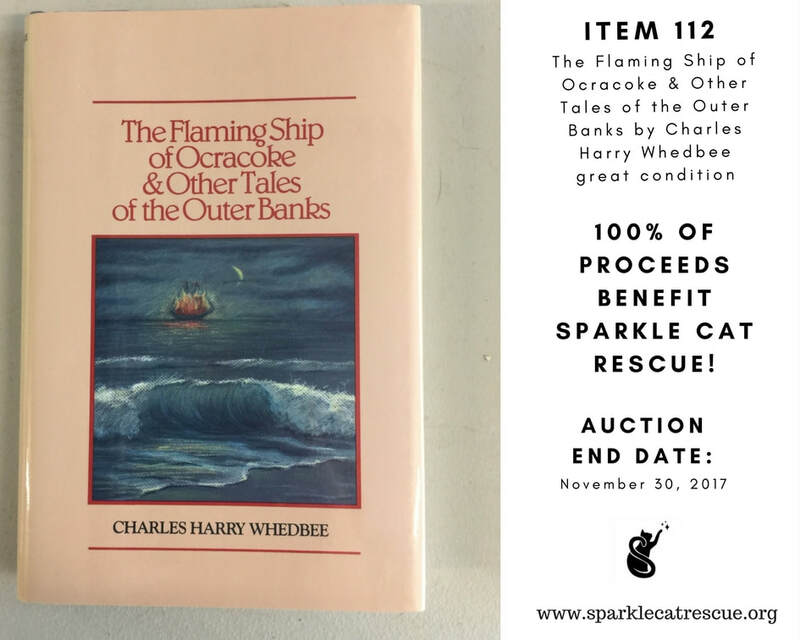 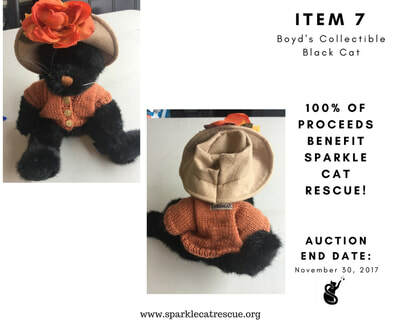 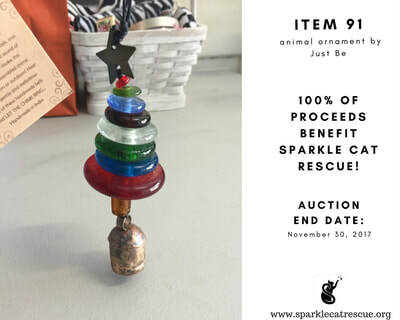 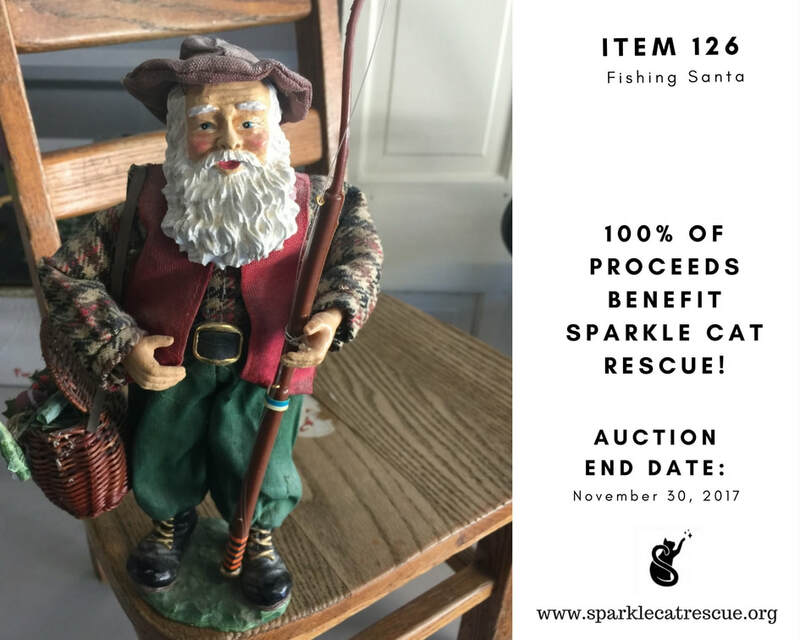 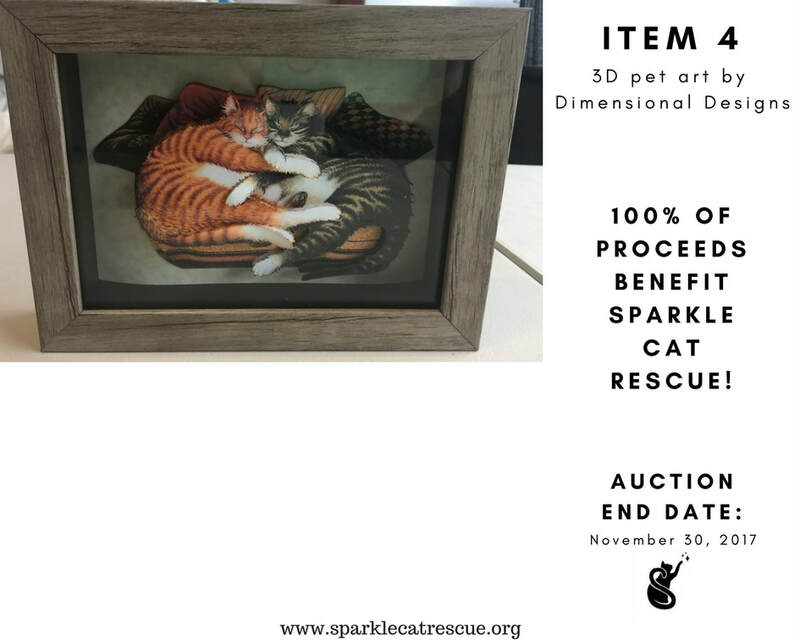 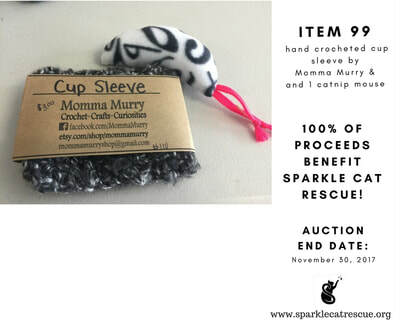 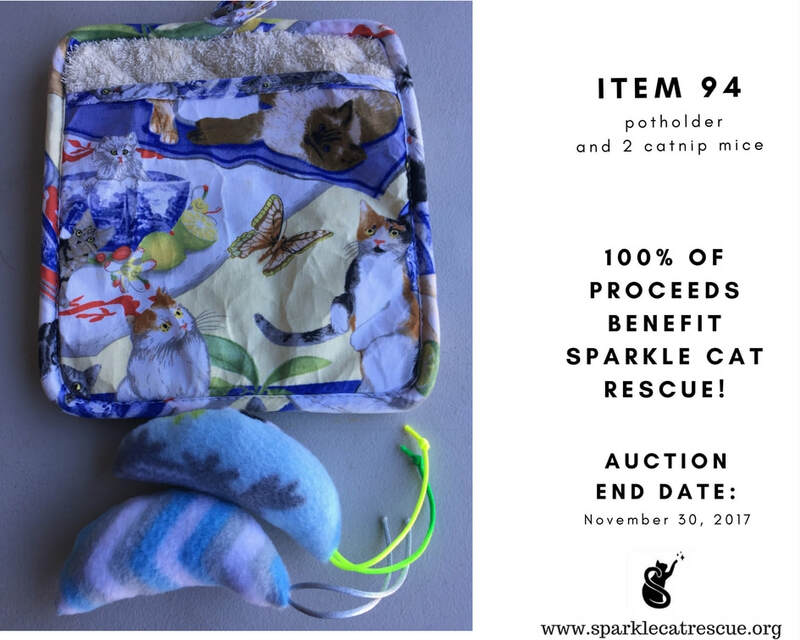 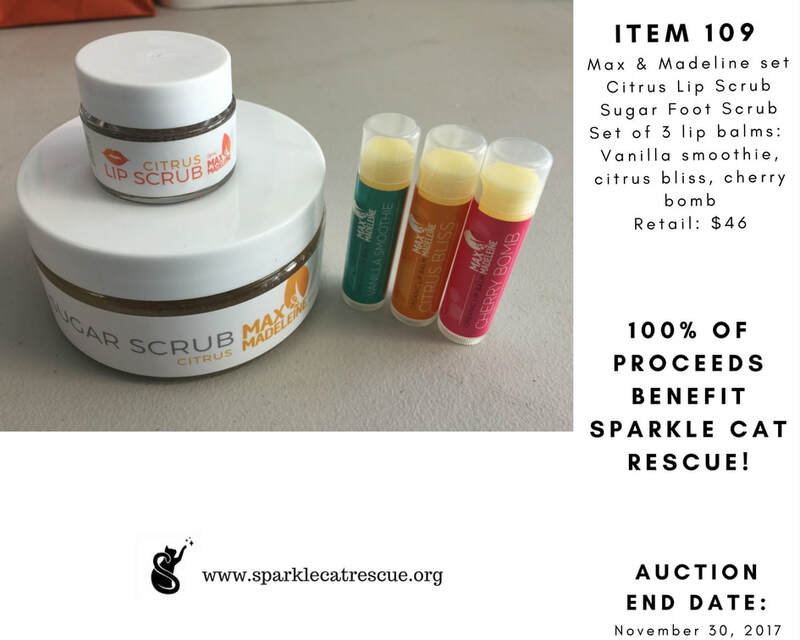 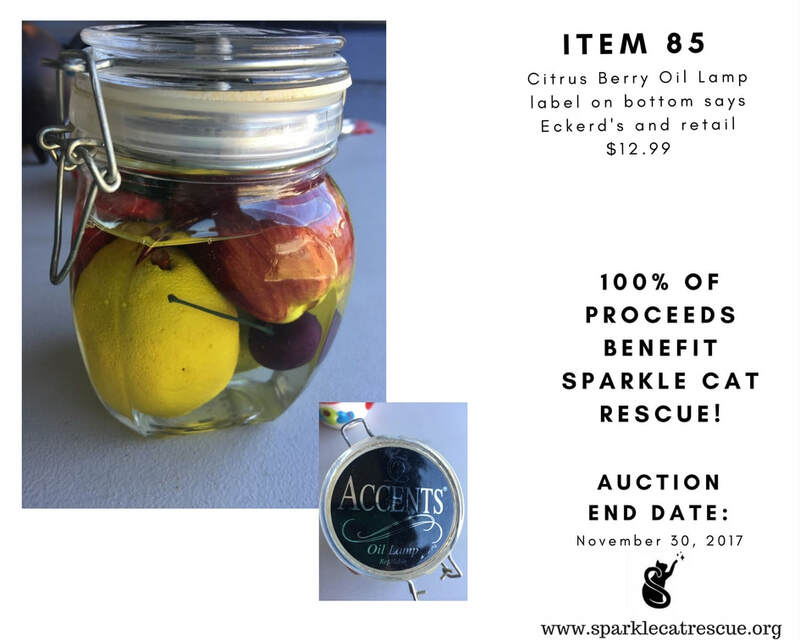 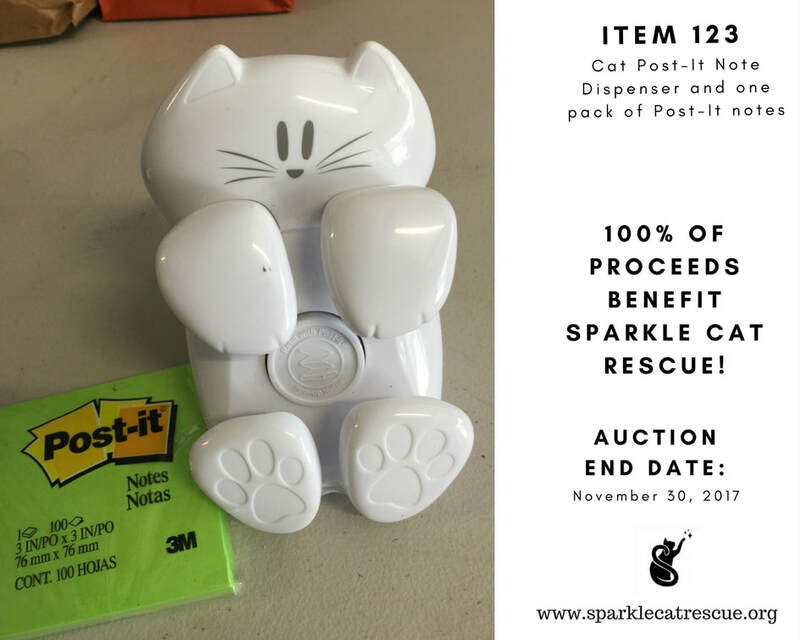 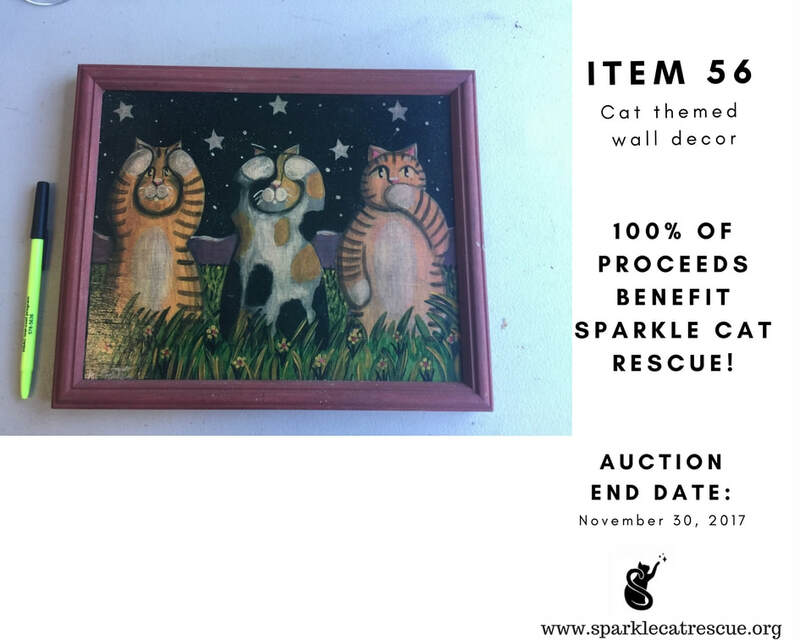 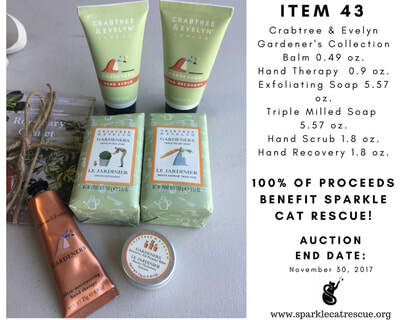 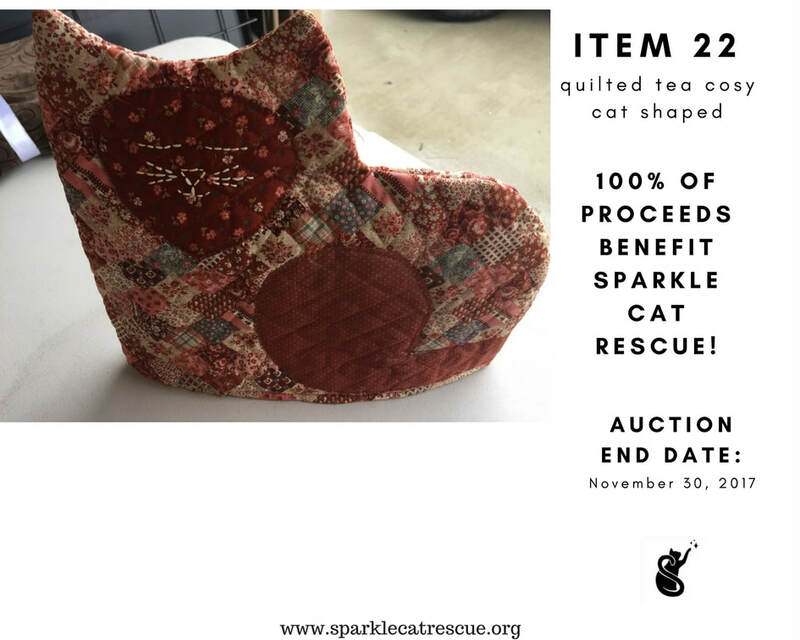 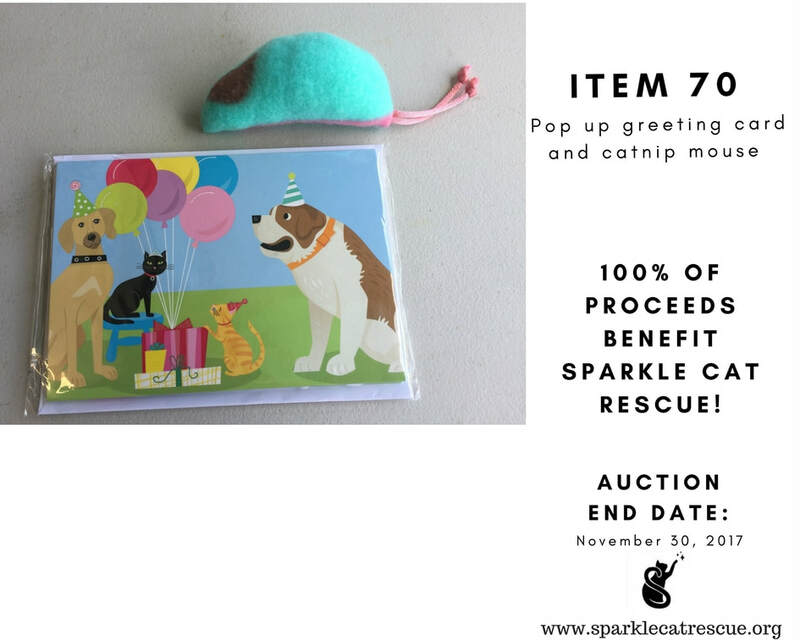 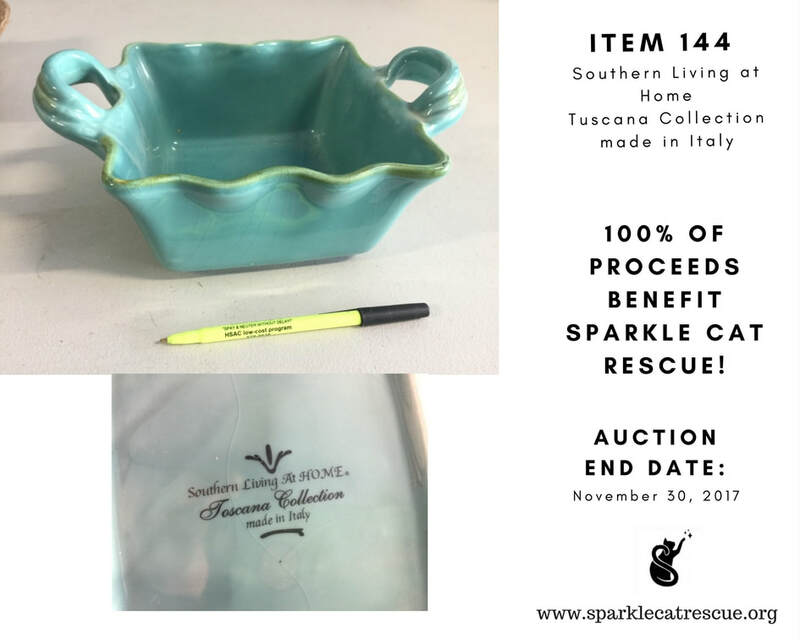 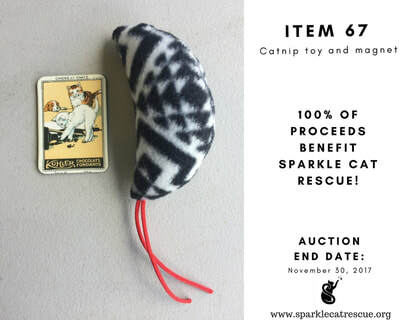 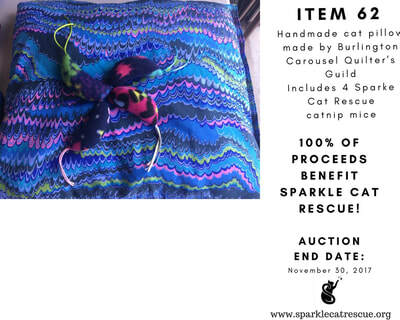 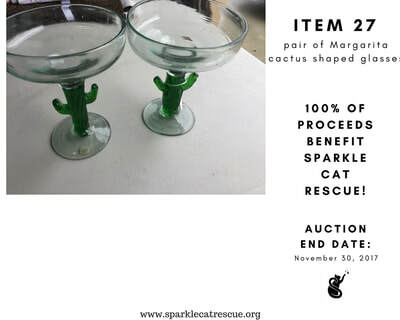 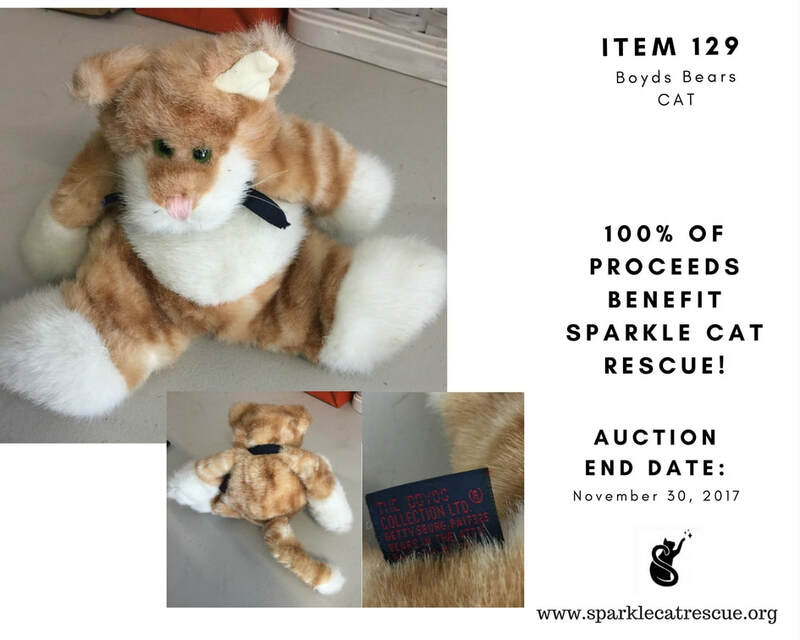 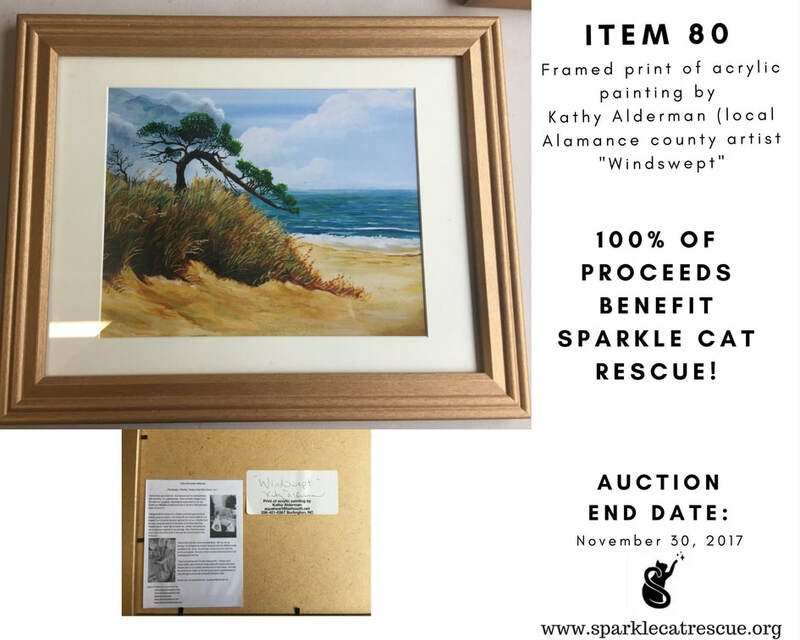 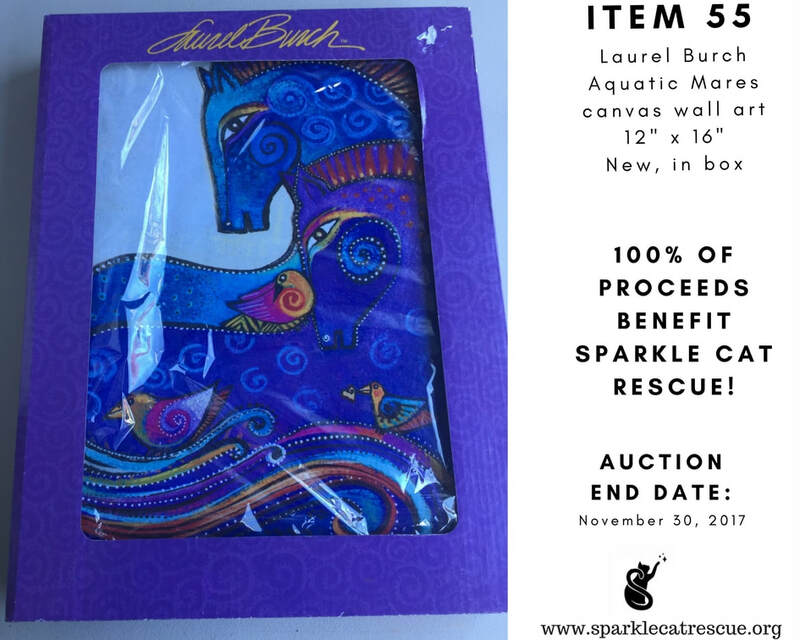 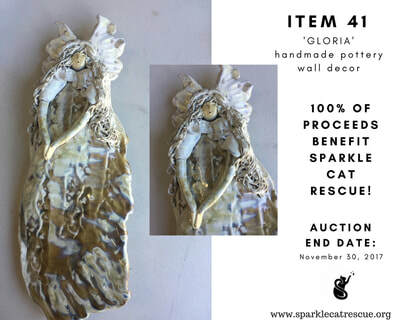 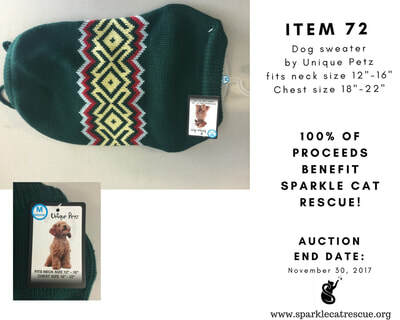 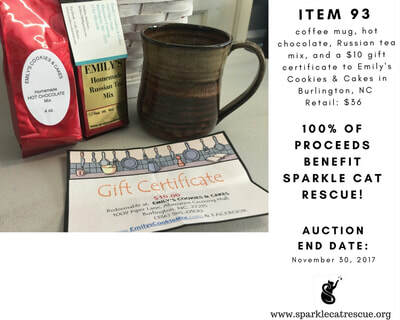 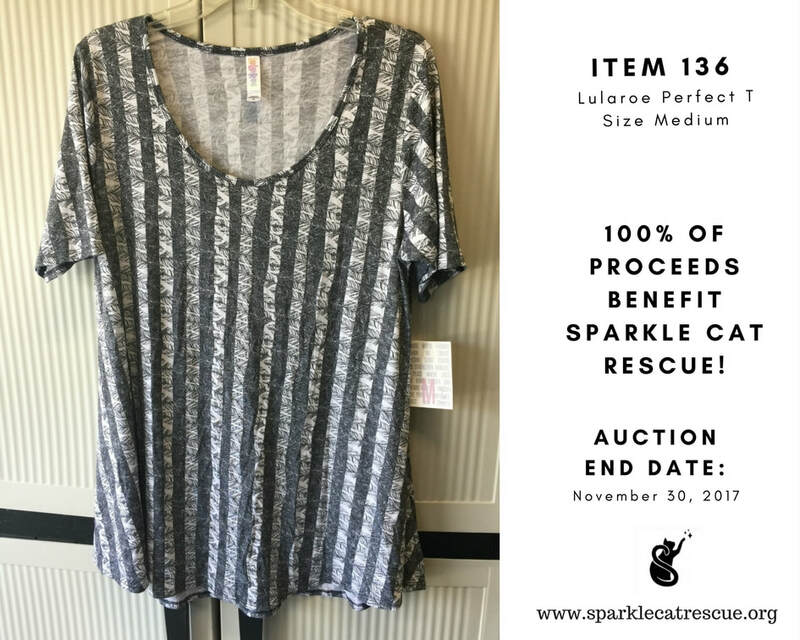 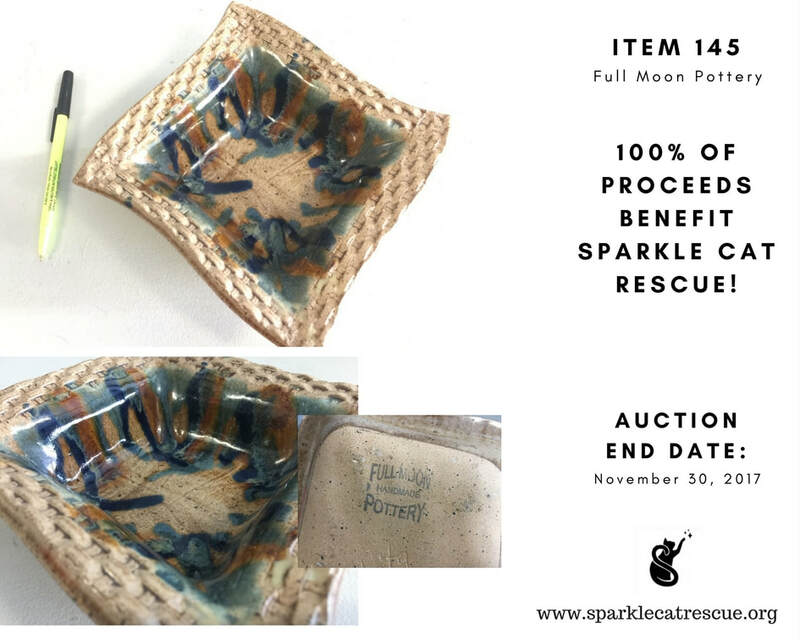 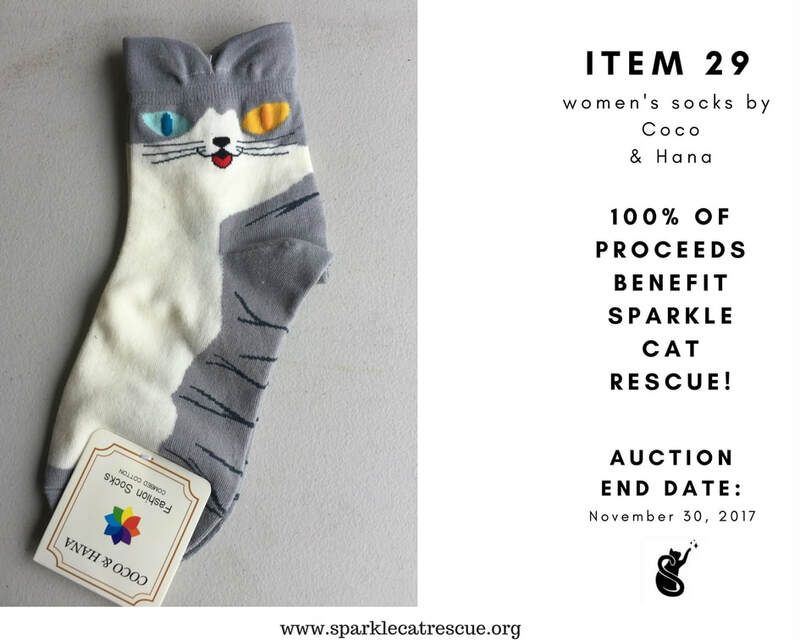 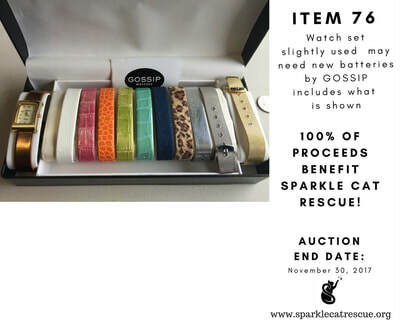 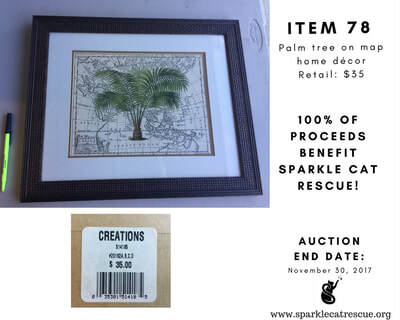 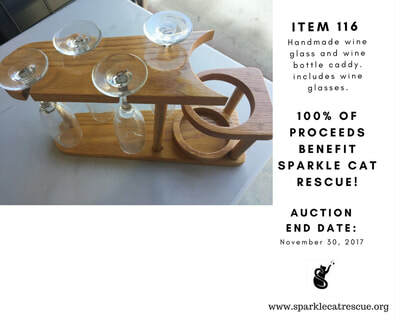 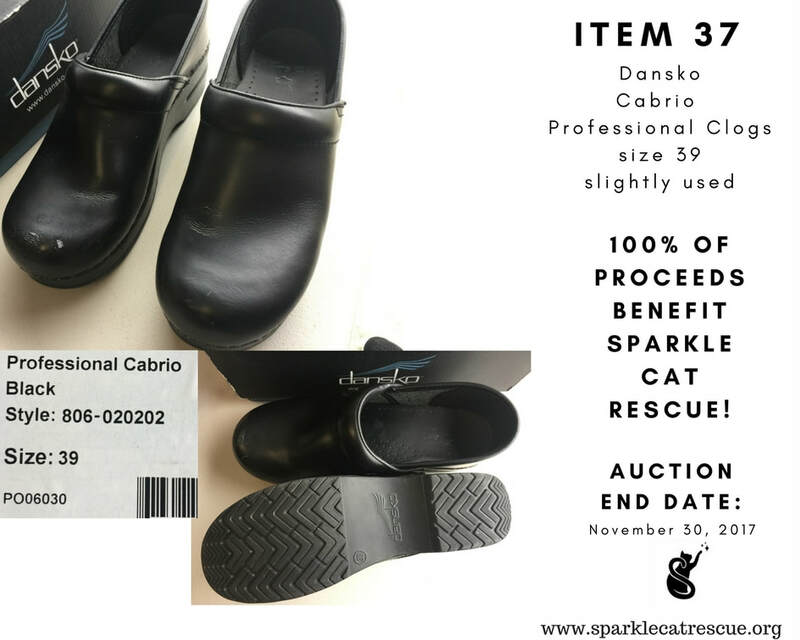 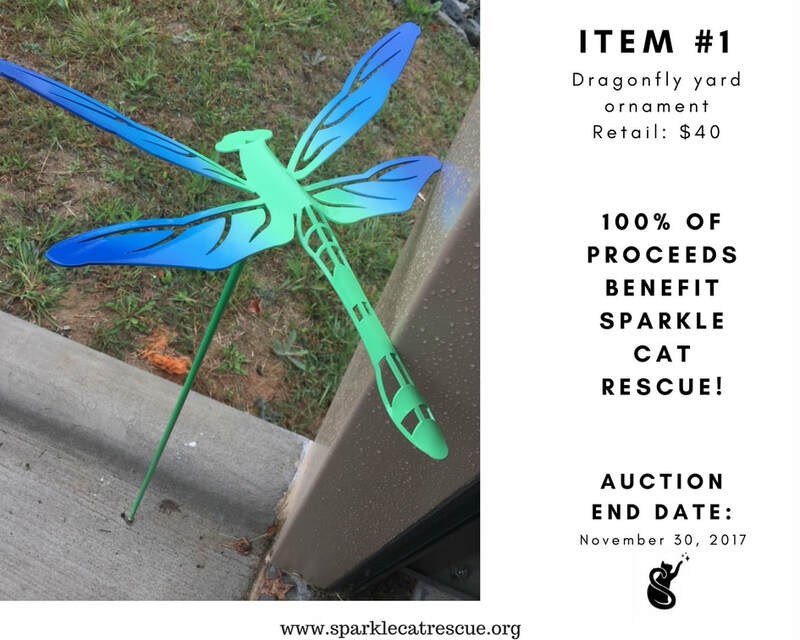 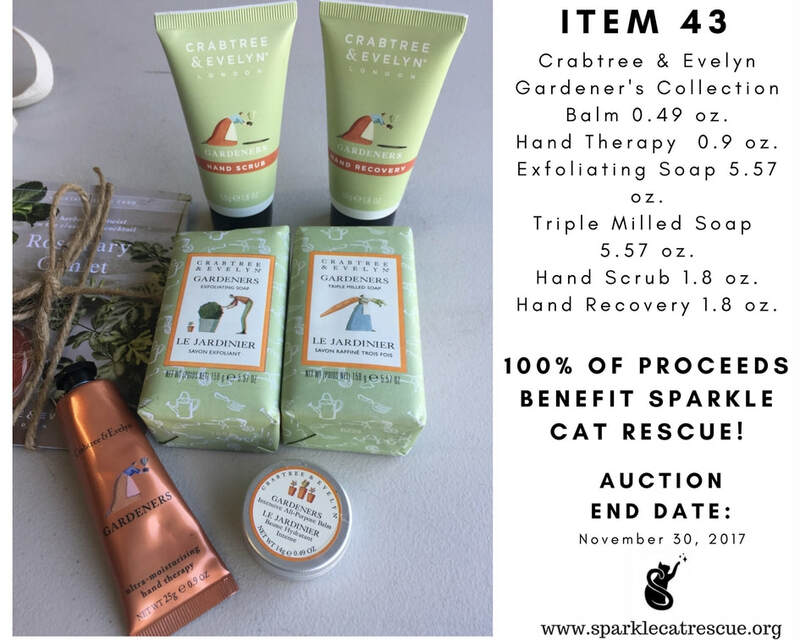 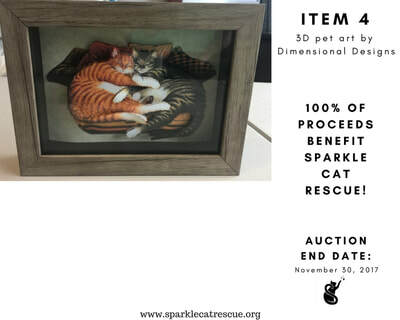 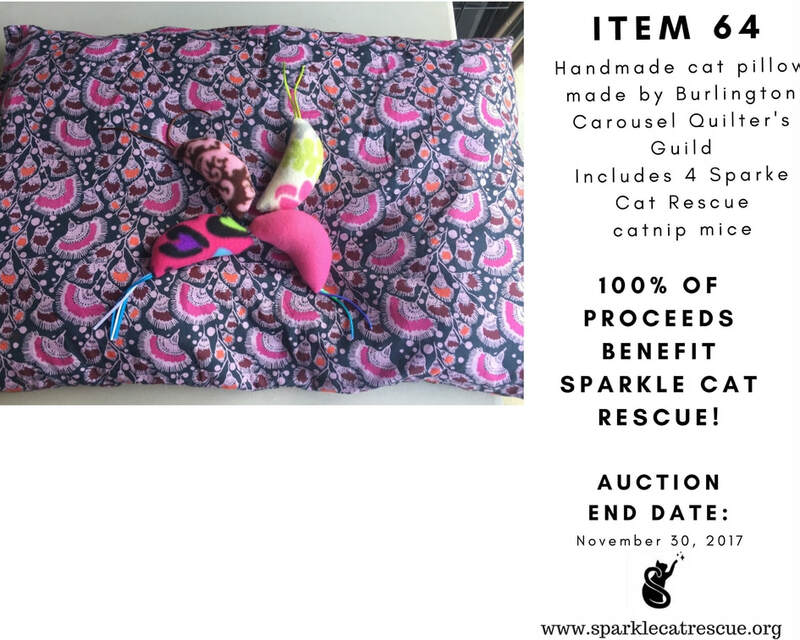 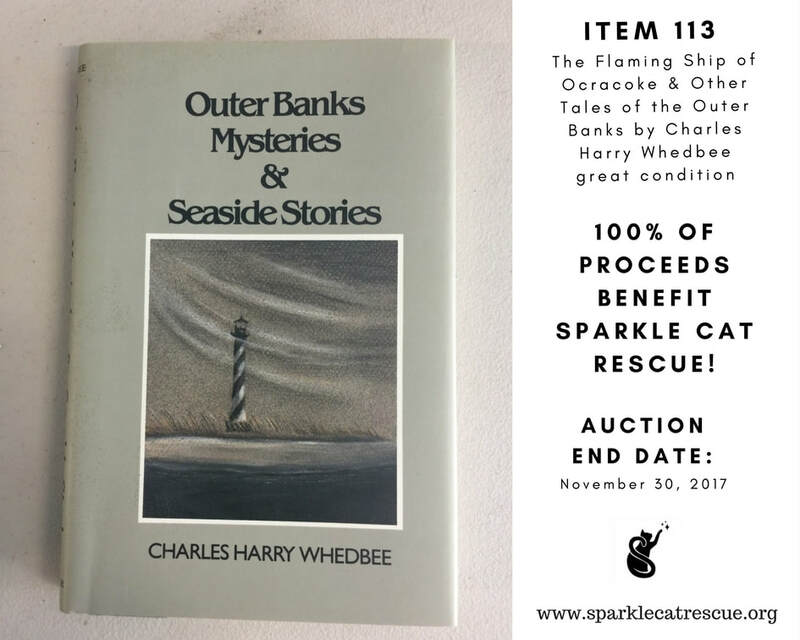 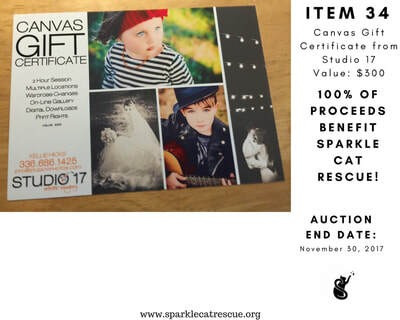 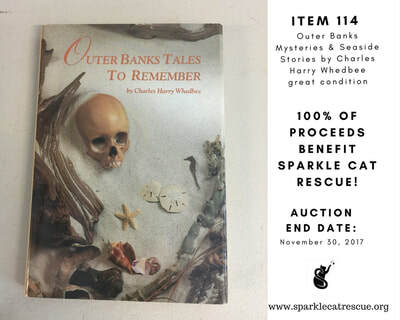 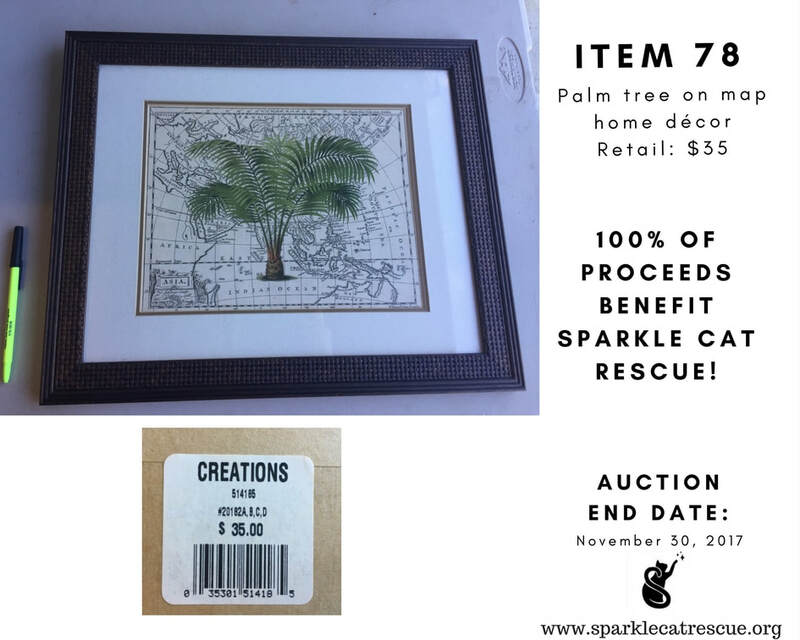 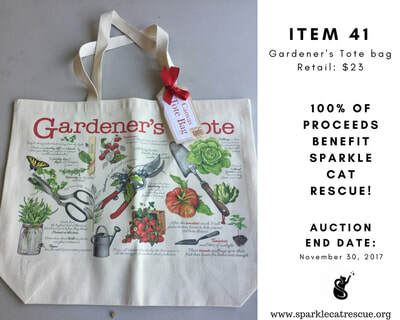 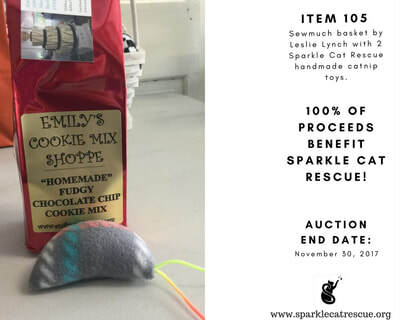 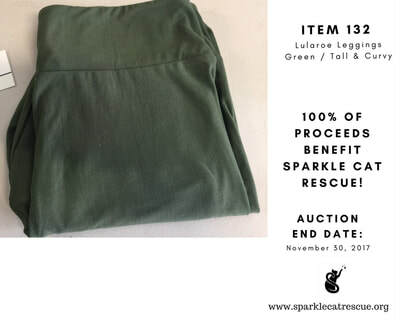 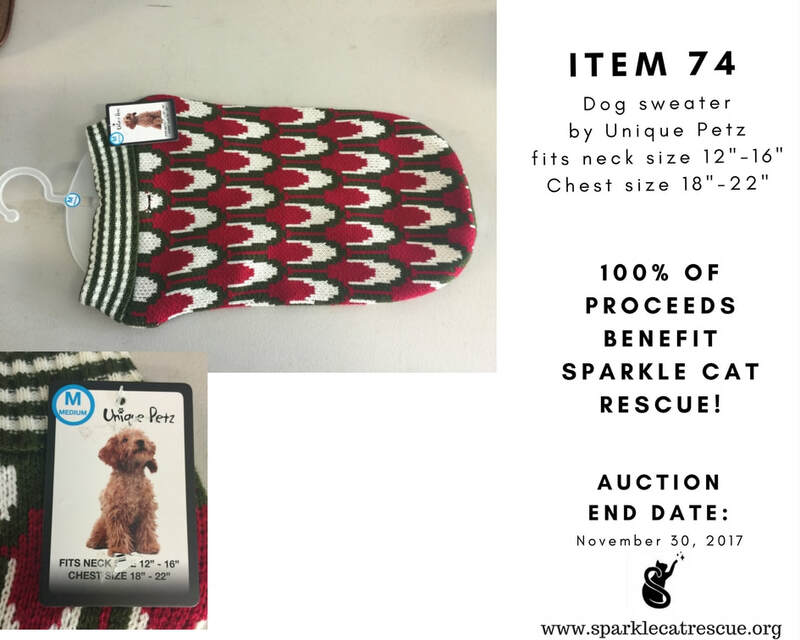 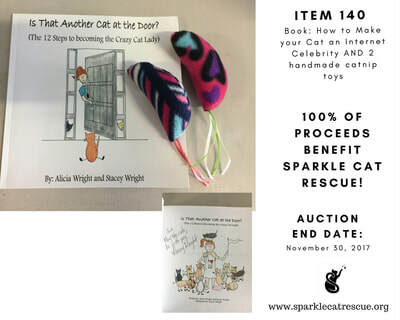 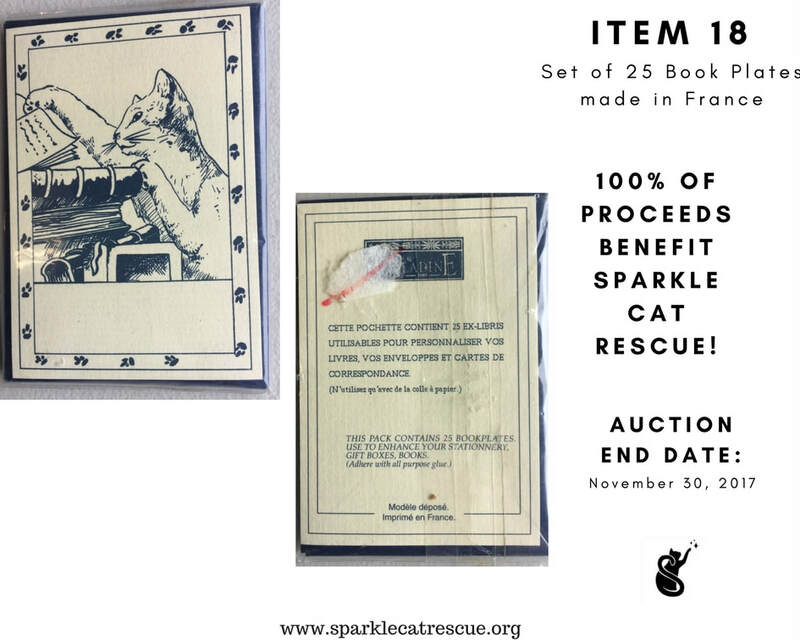 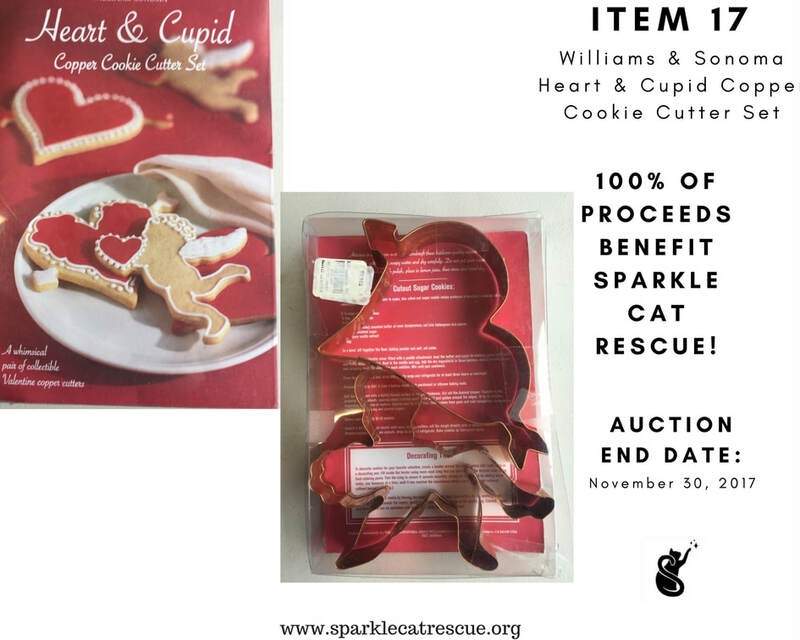 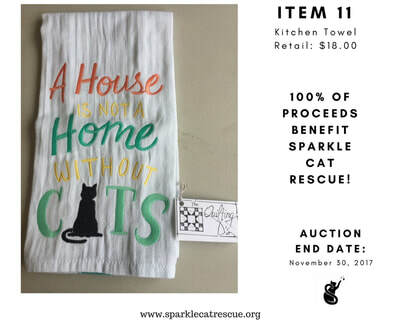 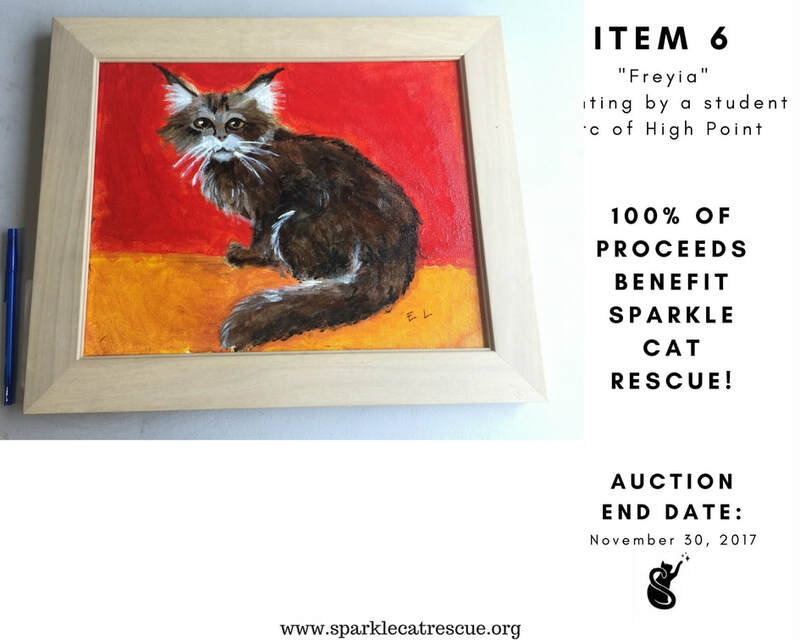 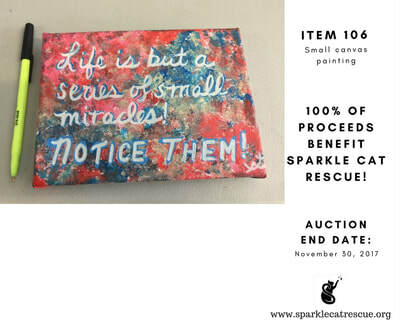 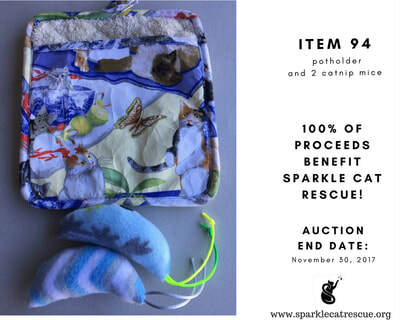 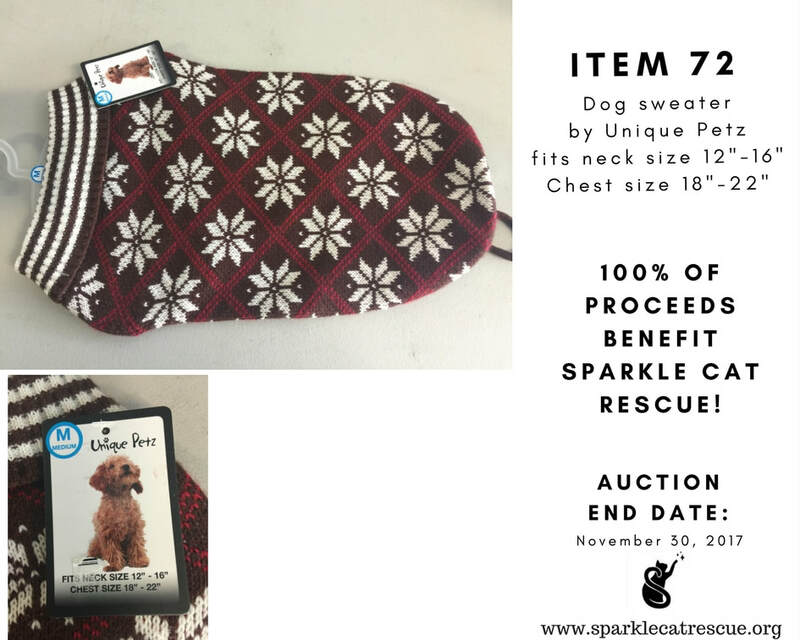 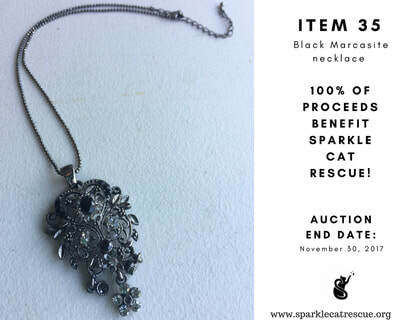 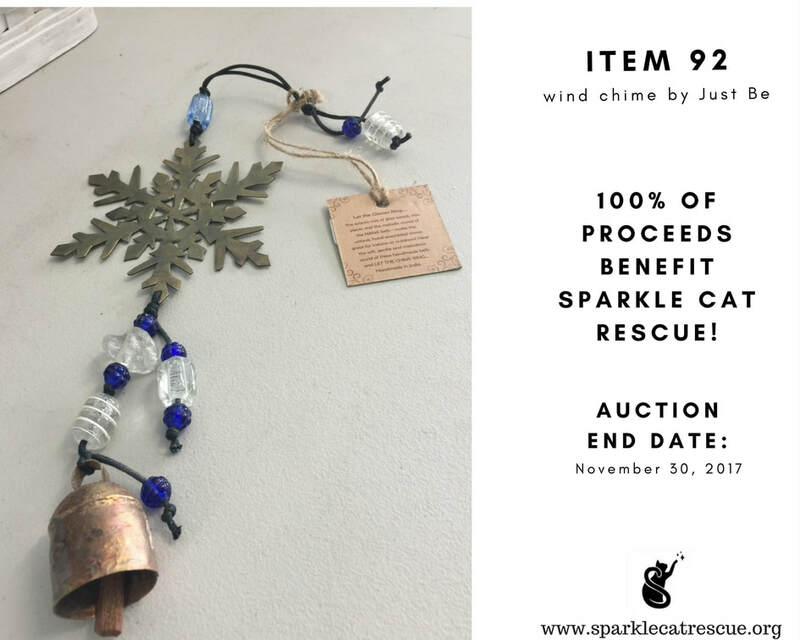 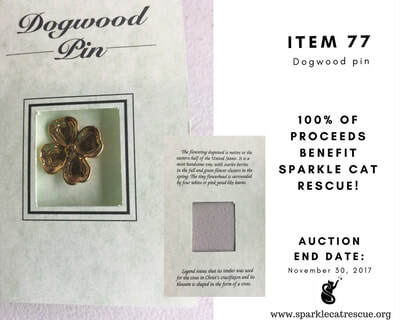 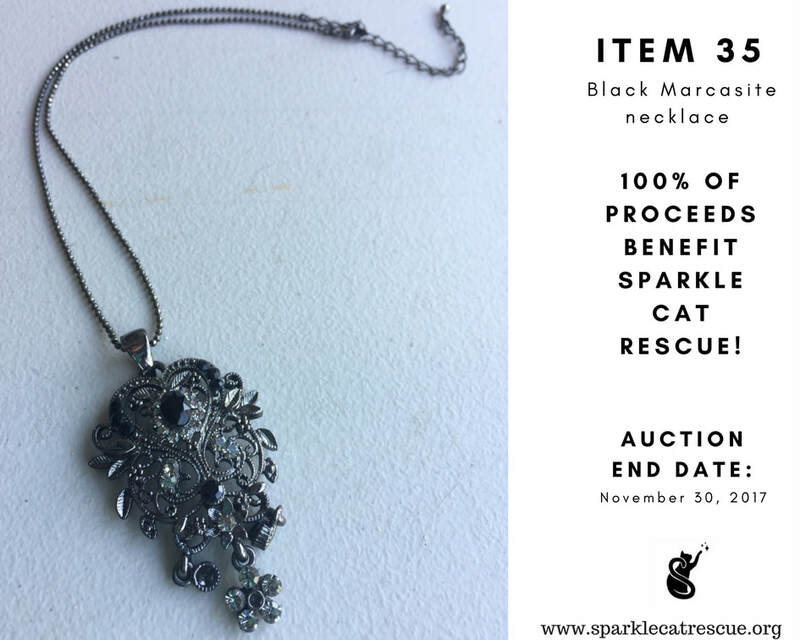 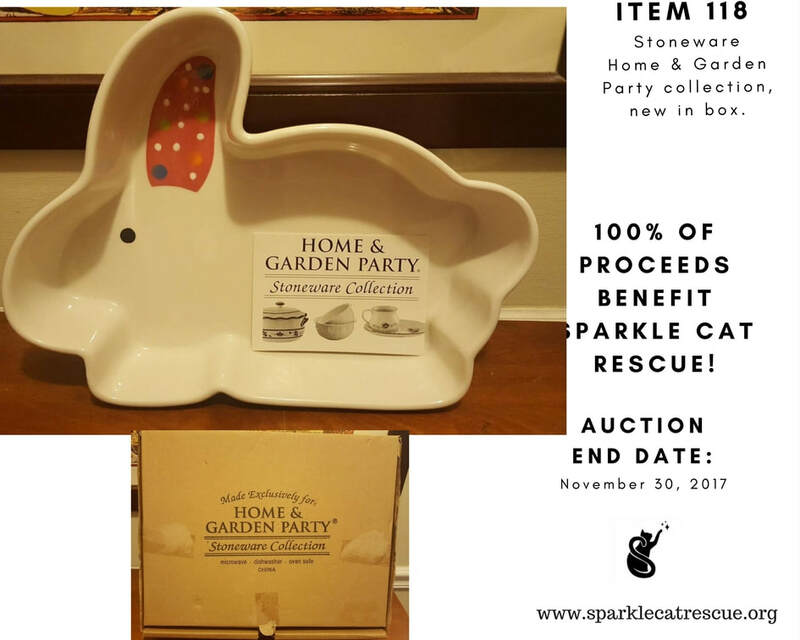 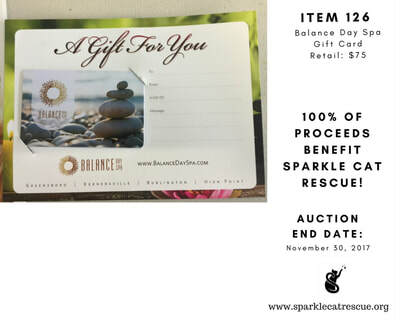 ​If you would like to donate to the current auction or future auctions or to our eBay Charities store and future Etsy store, please contact us at sparklecatrescue@gmail.com We are accepting gift certificates, gift baskets, new and gently used items. 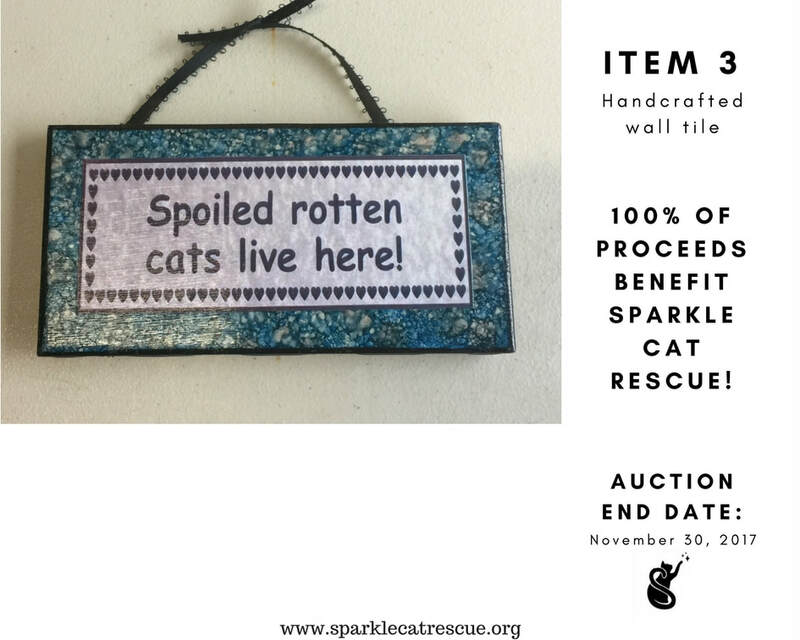 Donations do not have to be cat themed. 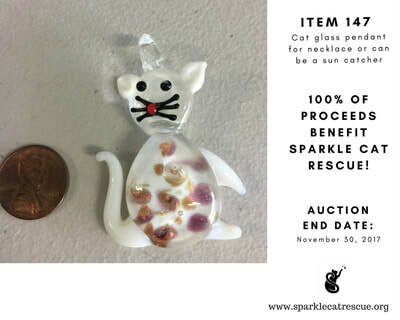 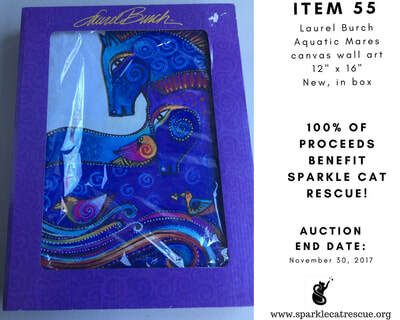 ​Sparkle Cat Rescue is an all-volunteer 501 (c)(3) nonprofit organization and your donations are tax deductible!